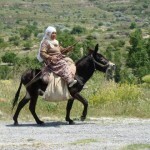 Opplev det flotte landskapet i Kappadokia fra hesteryggen. 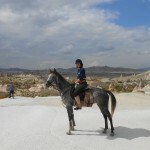 Dette unike landskapet kan utforskes på flere forskjellige turer. 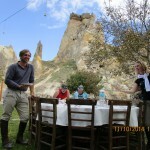 Uansett hvilken reiserute du velger vil du få se de karakteristiske steinskorsteinene»rock chimneys». 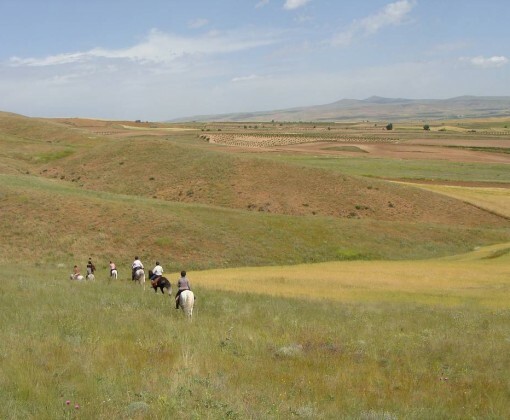 Det er flere fine landsbyer og historiske steder langs rutene, med gjestfri lokalbefolkning. 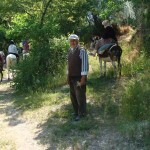 Kategorier: Bulgaria & Hellas & Tyrkia, Hellas & Bulgaria & Tyrkia, Rideferier. 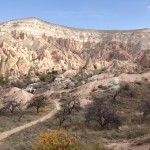 Cappadocia ligger i det sentrale Anatolia midt i Tyrkia. 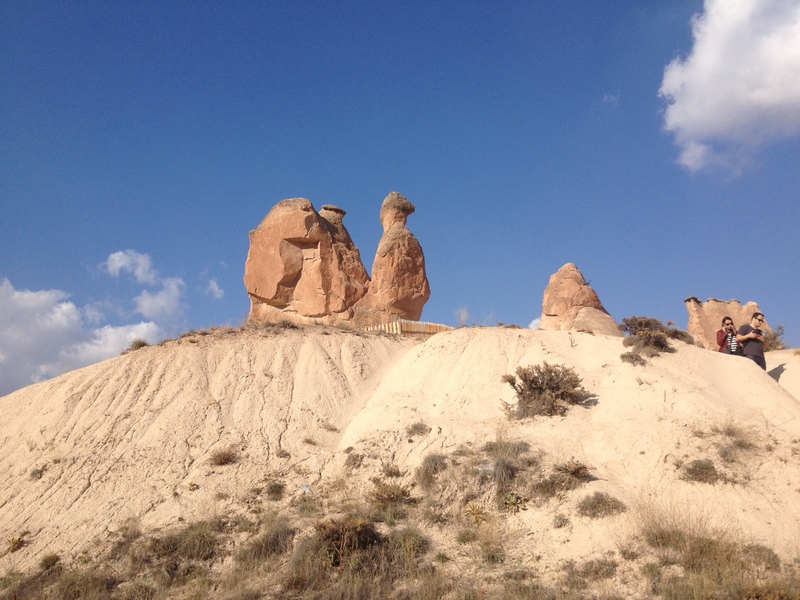 Området er visuelt unikt og kjent for tre ting som alle er relatert til den underliggende geologien; de karakteristiske skorsteinene i stein (fairy chimneys), underjordiske byer og de kristne kirkene skåret ut i stein. 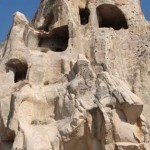 De karakteristiske steinskorsteinene i Cappadocia er på grunn av erosjon av hard vulkansk stein som ligger over mykere steinlag. 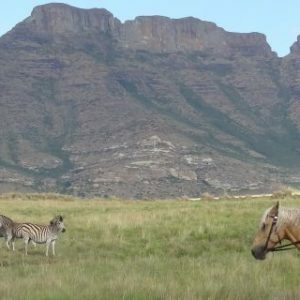 Denne geologiske særheten er også ansvarlig for de mange grottene og underjordiske husene i området og forklarer hvorfor området har vært kontinuerlig bebodd siden bronsealderen. Navnet Cappadocia kommer fra uttrykket «de vakre hesters land» så dette er et veldig passende sted for en rideferie. 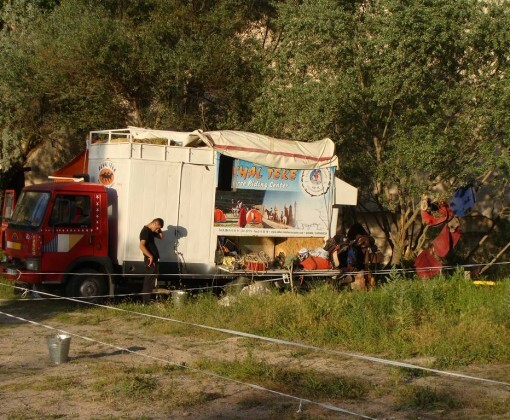 Det er to ulike reiseruter i Cappadocia avhengig av om du forestrekker å bo på hotell eller er fornøyd med camping. 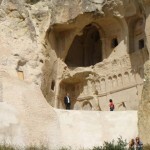 Det er normalt mulighet til å besøke Goreme Open Air Museum for å se de fryktinngyvende malte kirkene bygget av eksil kristne under romertiden. 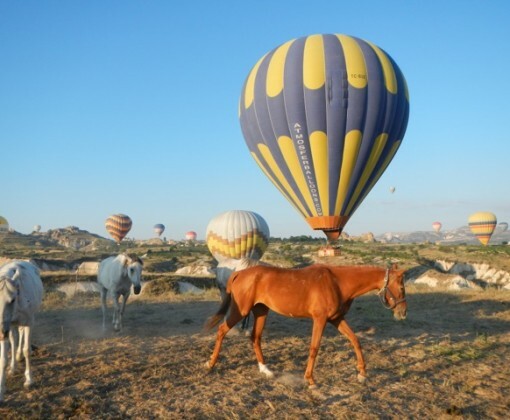 Et høydepunkt for mange er en flytur med varmluftsballong over steinskorsteinene. 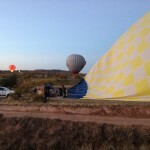 Det er uansett et flott syn å stå på bakken å se på alle ballongene i luften. 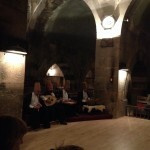 I tillegg arrangers det turen Phrygian way 1 gang i løpet av sommeren. 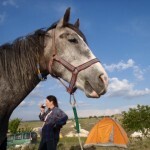 Hestene er en blanding av rene arabere, araber-anatolian og akhal-teke (tinker) krysninger. 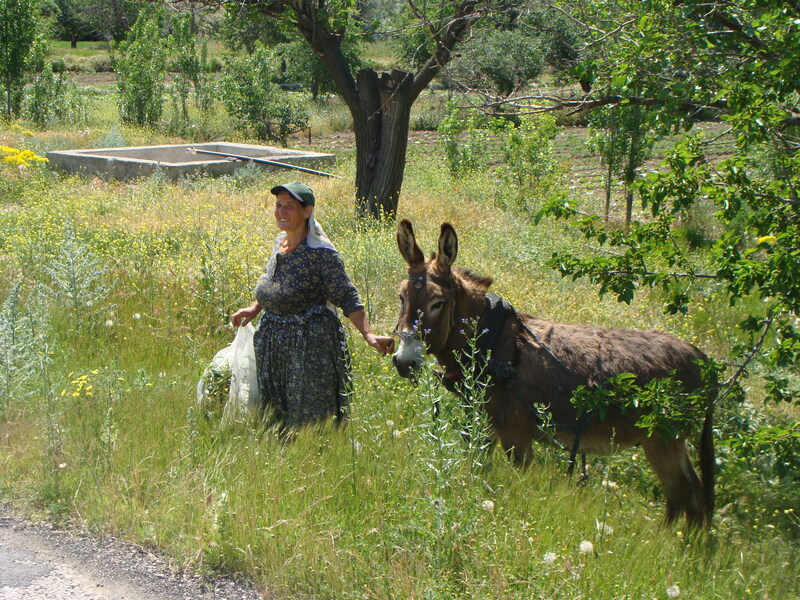 Noen er veldig livlige og sterk i galopp. 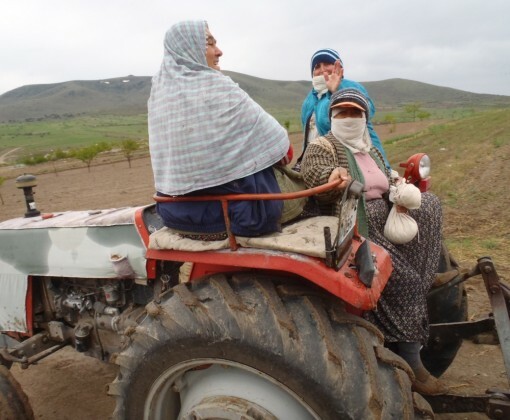 Terrenget er variert med noen bratte opp og nedstigninger og teknisk ridning. 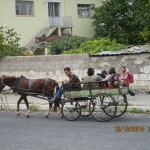 Det er også mulighet for noen lange galopper. 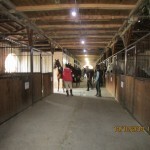 Du må være en trygg rytter med god kontroll over hesten din på tur i både trav og galopp. 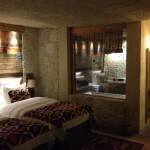 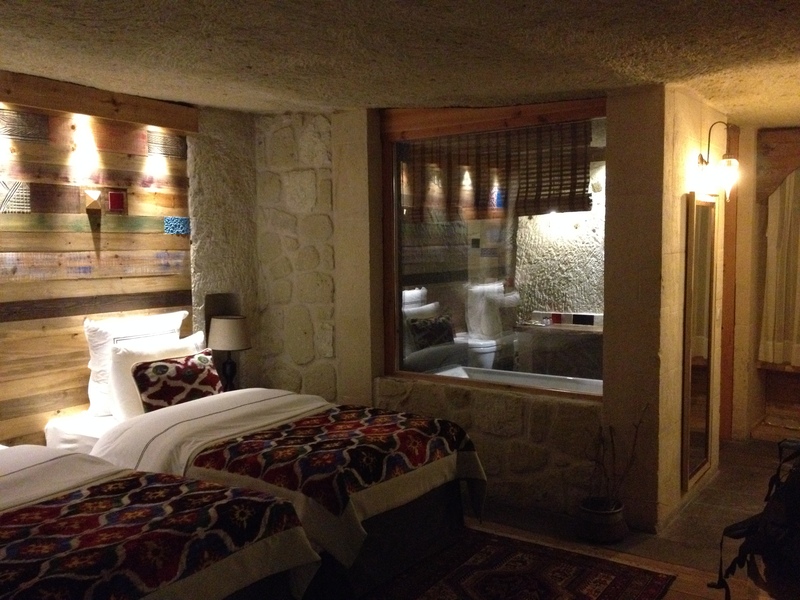 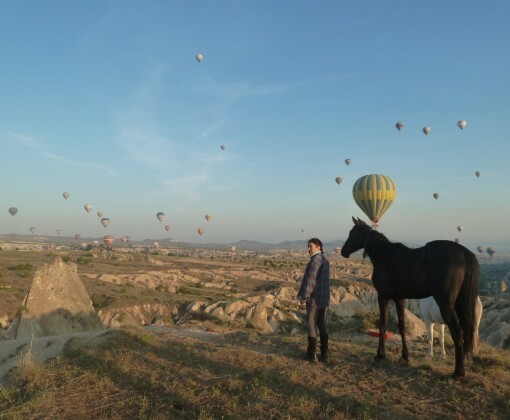 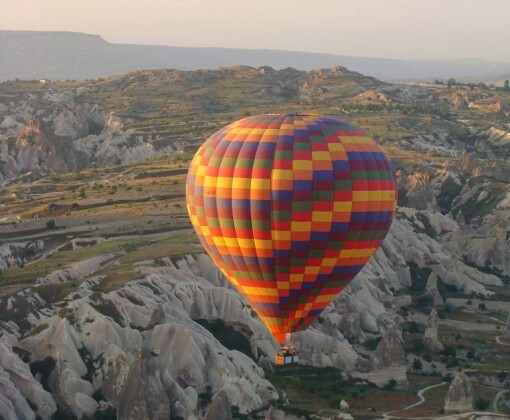 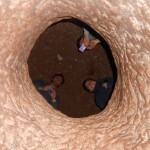 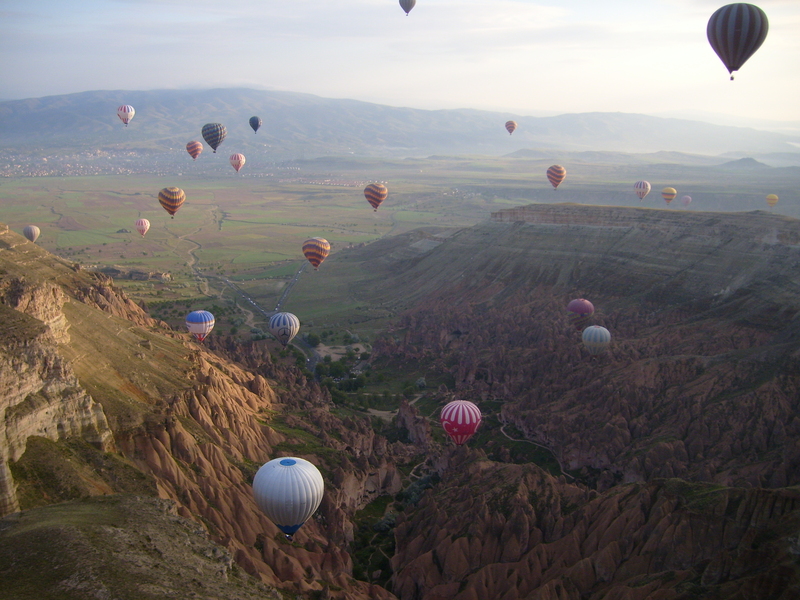 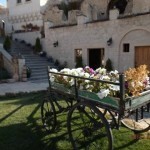 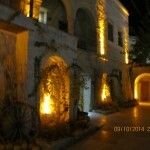 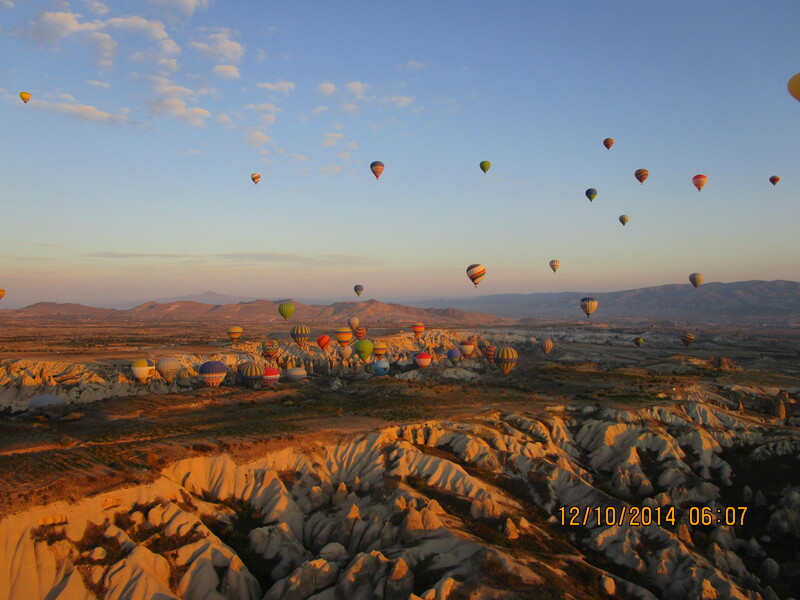 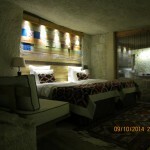 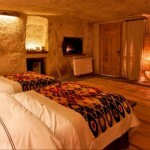 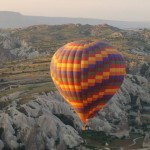 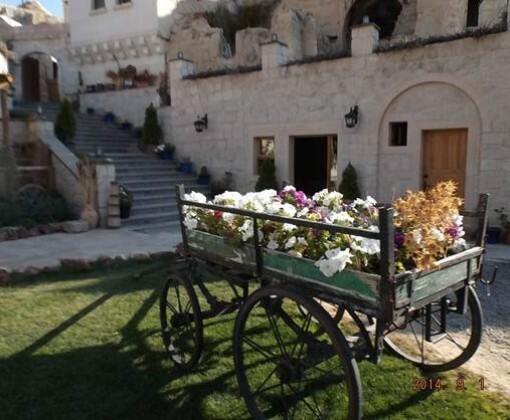 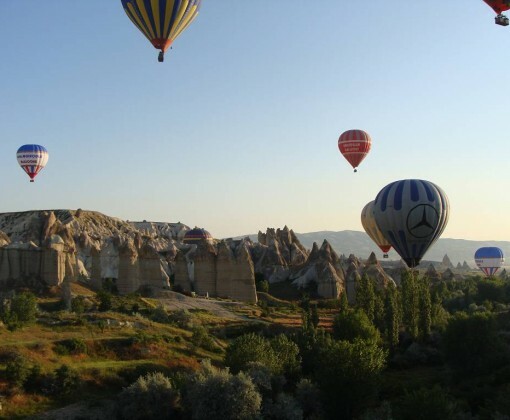 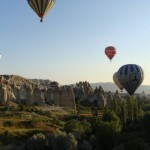 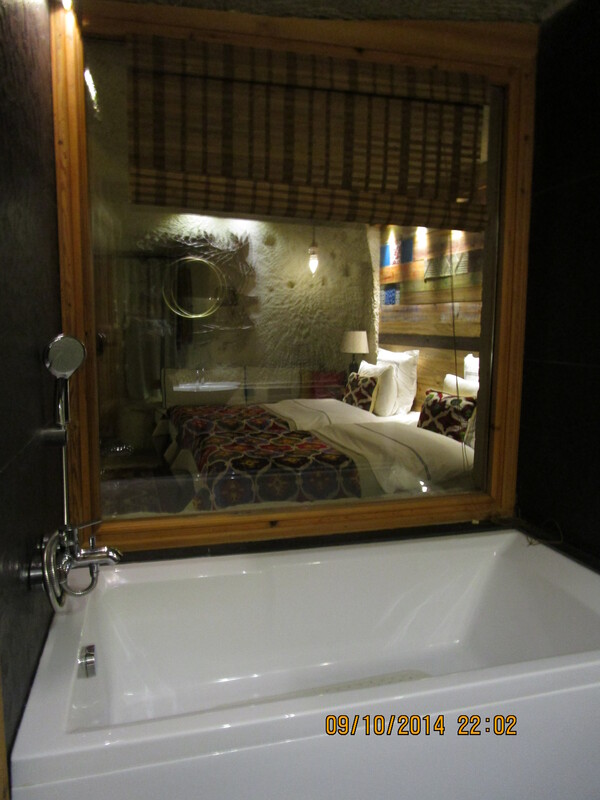 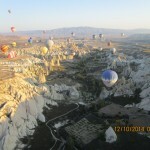 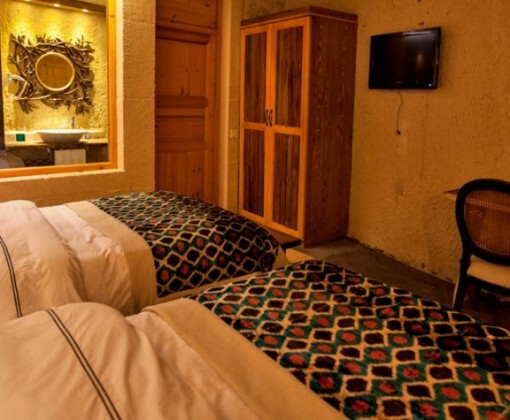 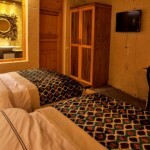 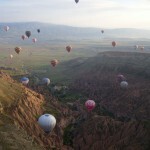 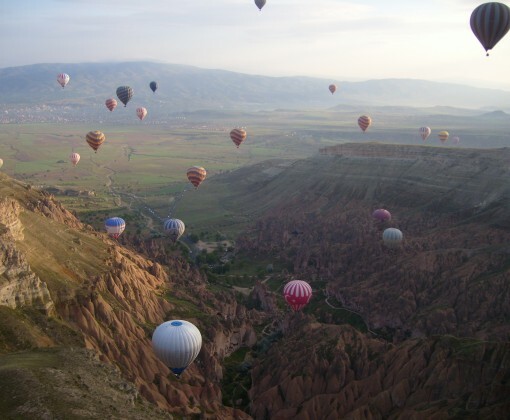 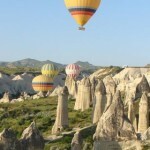 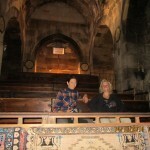 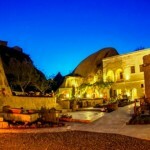 The Cappadocia Highlights is a six-night itinerary staying in the Queens Cave Hotel in Ortahisar. 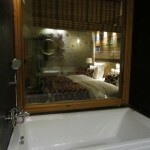 On occasions other hotels are used but always of a similar standard. 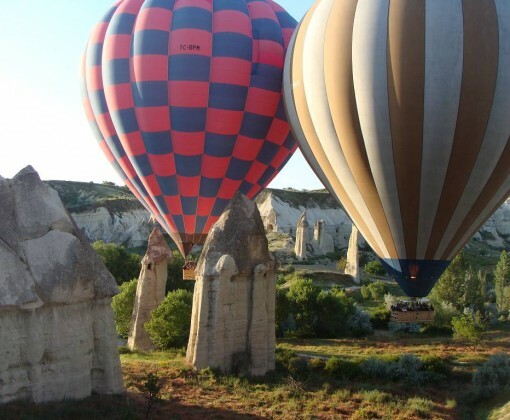 During the week there is an opportunity to visit the Göreme Open Air Museum to see the awe-inspiring painted churches built by exiled Christians during the Roman era as well as watch the whirling dervishes perform in a 13th Century caravanserai. 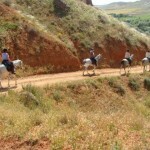 The visits will be arranged whilst you are there so that you can go when there are fewer tourists. 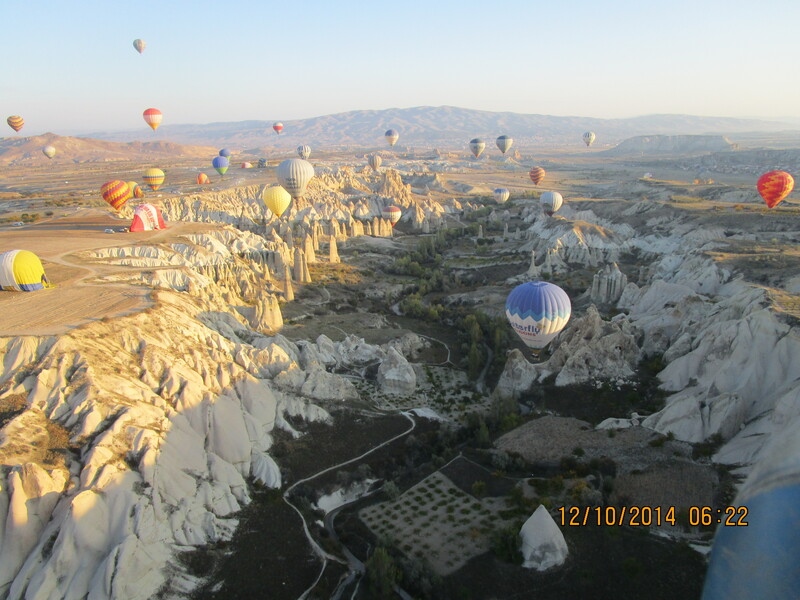 The following is the proposed itinerary but it is subject to change due to local conditions. 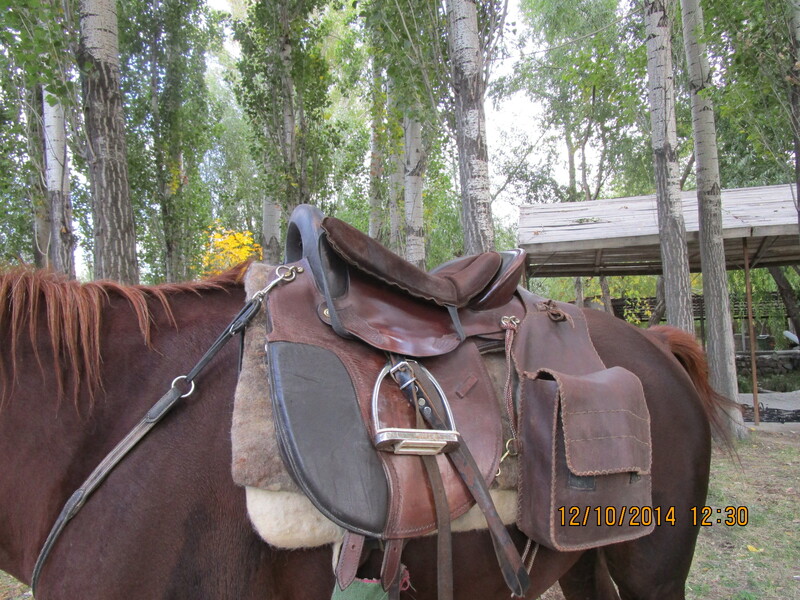 Riding times are an approximation. 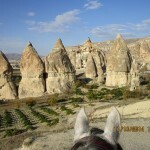 Arrival at Nevsehir or Kayseri Airport. 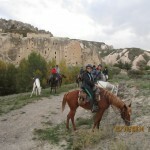 Transfer and check in at the hotel in Ortahisar. 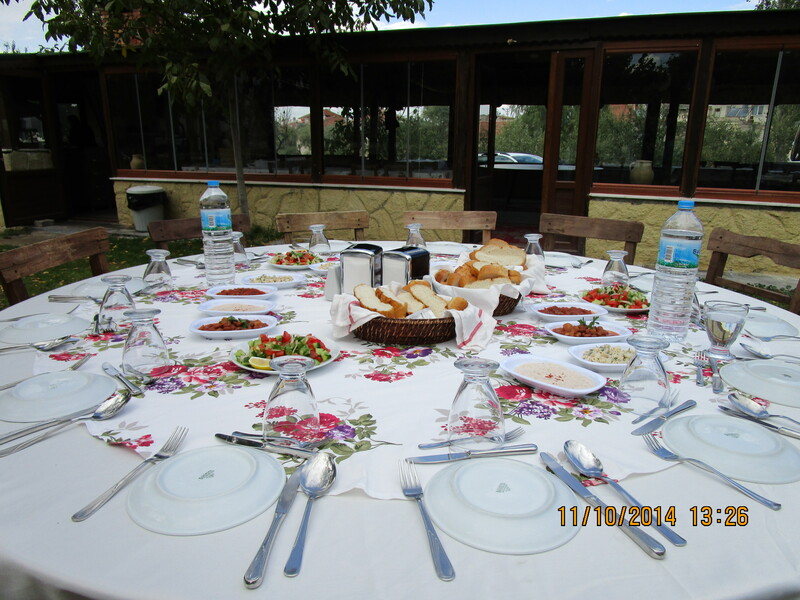 Dinner and overnight in Ortahisar. 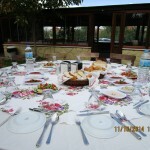 Breakfast at your hotel at 8 am. 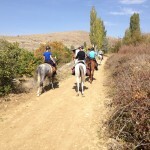 After breakfast at c. 9 am you will be met and transferred to the stables by vehicle. 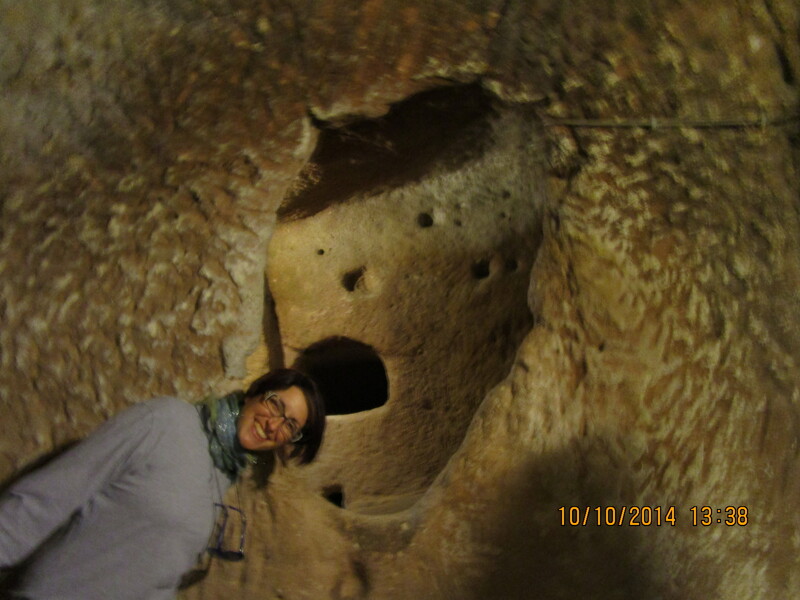 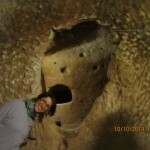 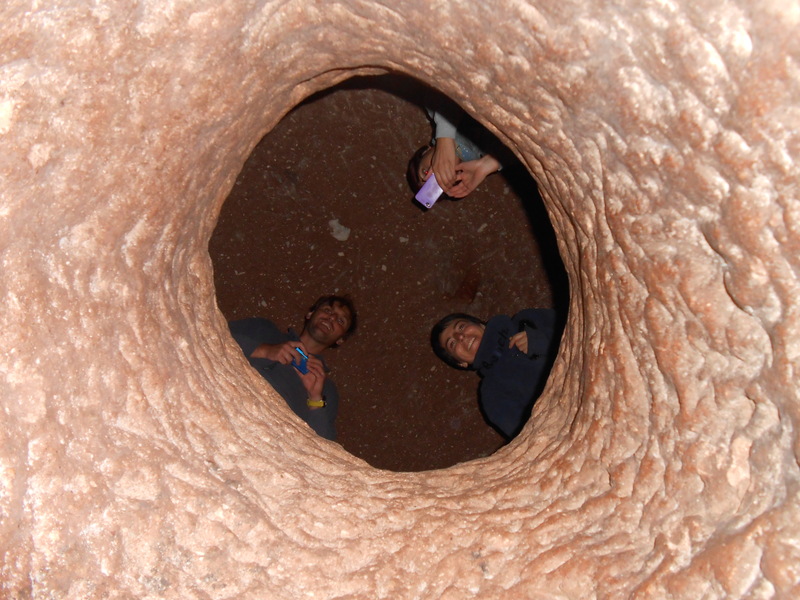 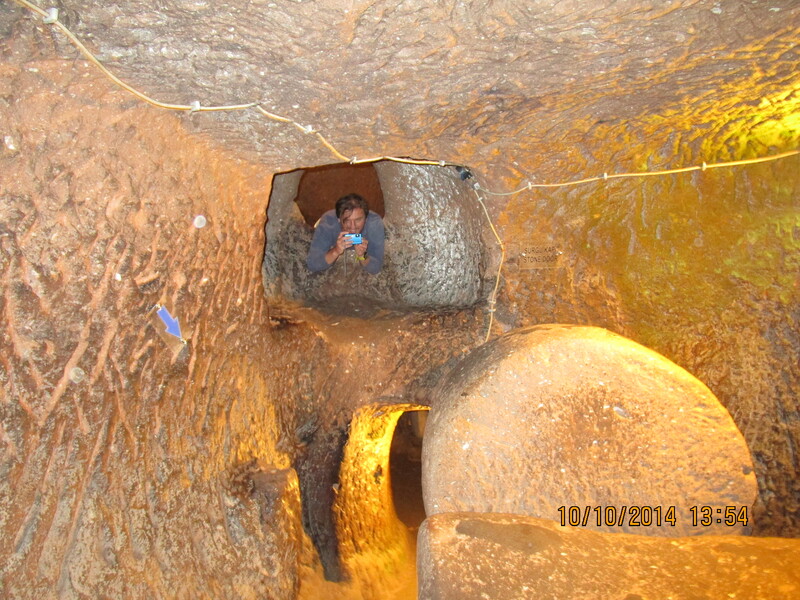 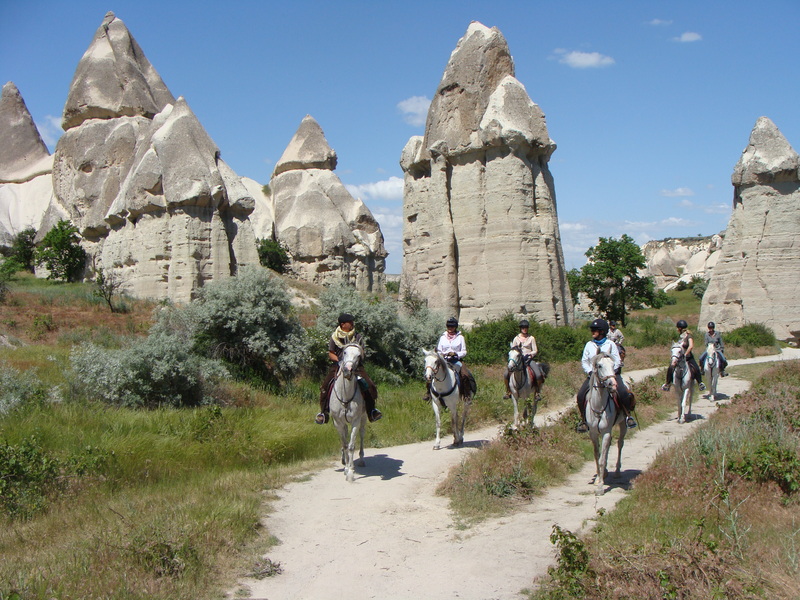 Today you will ride from Avanos to Ozkonak where you will visit one of Cappadocia ́s largest underground cities. 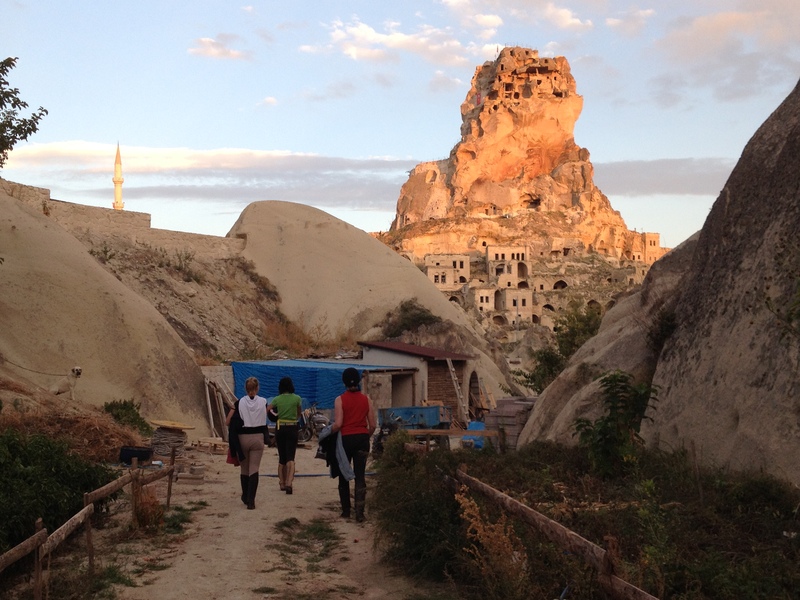 When excavated, the city revealed ten floors that could have housed 60,000 people for three months at a time. 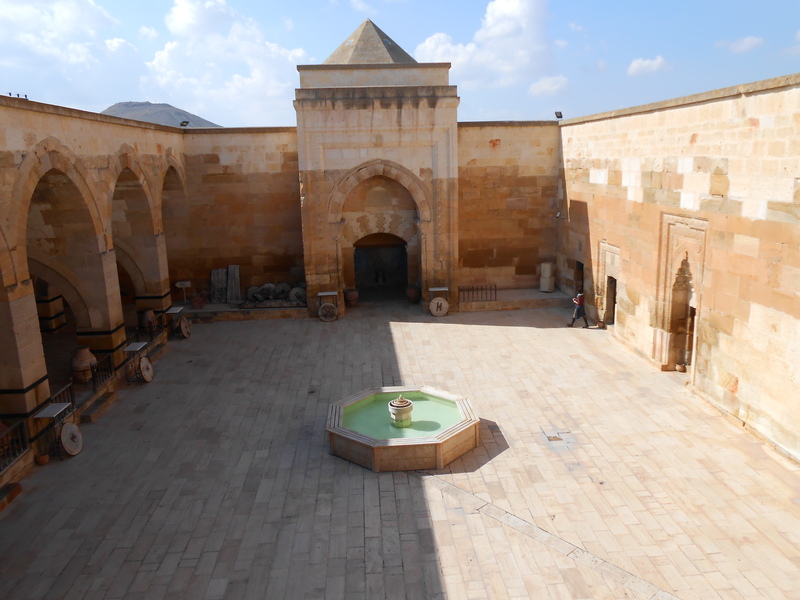 You can only visit the first four floors. 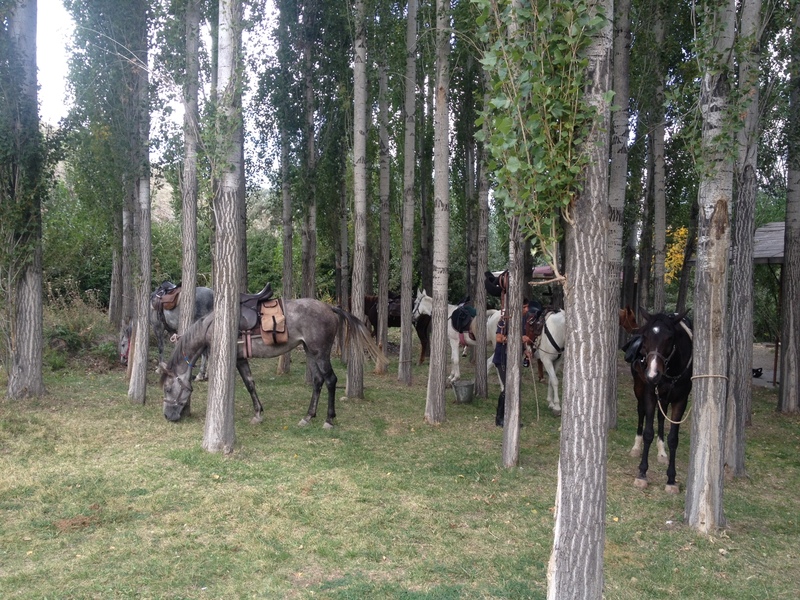 After breakfast at c. 9 am you will be met and transferred to the horses. 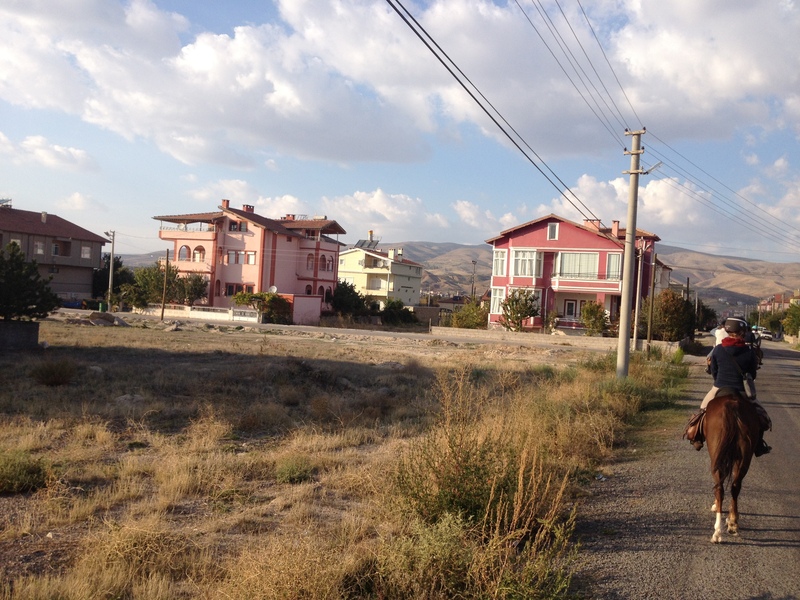 Todays ride will go from Avanos to Sarihidir, a tiny fishing village on the Red River. 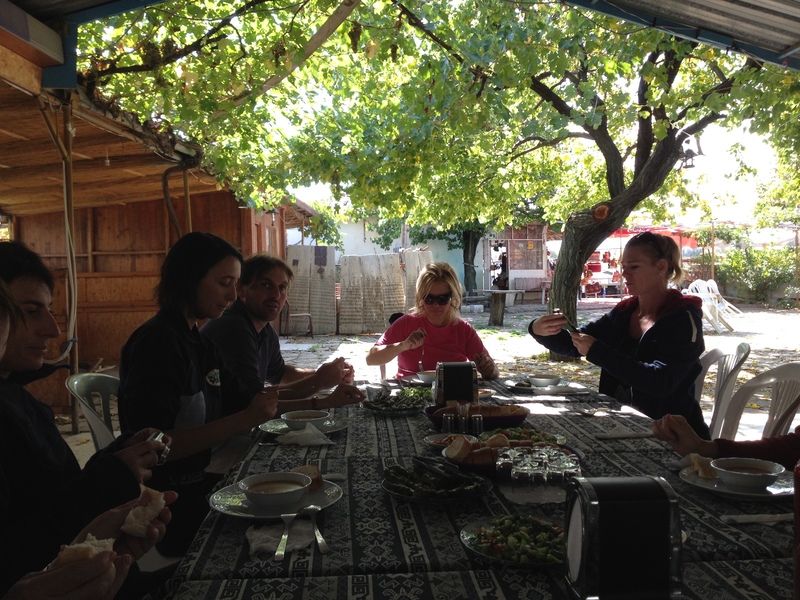 After a tea break at a local café you will continue onto Sarihan, a beautifully restored 13th century caravanserai for lunch. 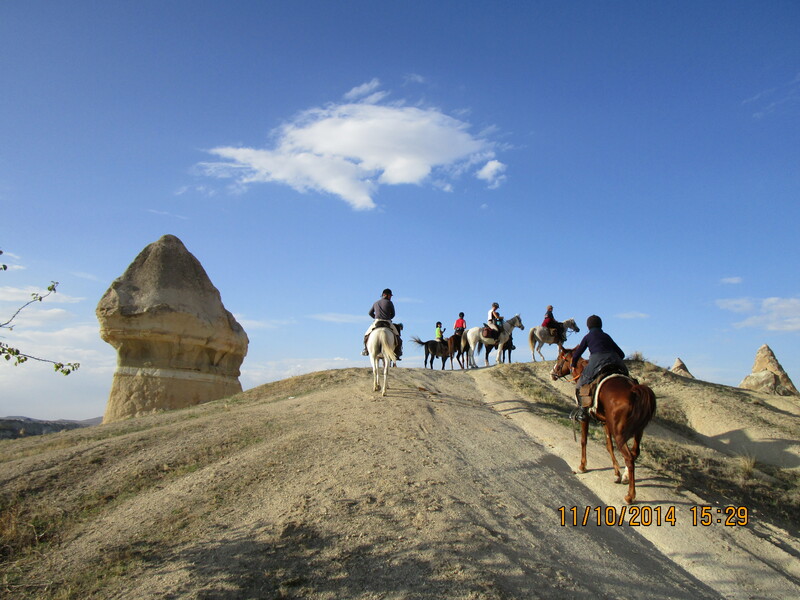 This afternoon you will ride amongst Cappadocias famed chimneys of Zelve, Pasabagi to Cavusin before returning to the ranch. 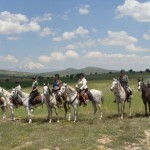 After breakfast at c. 9 am you will be met and transferred to the horses. 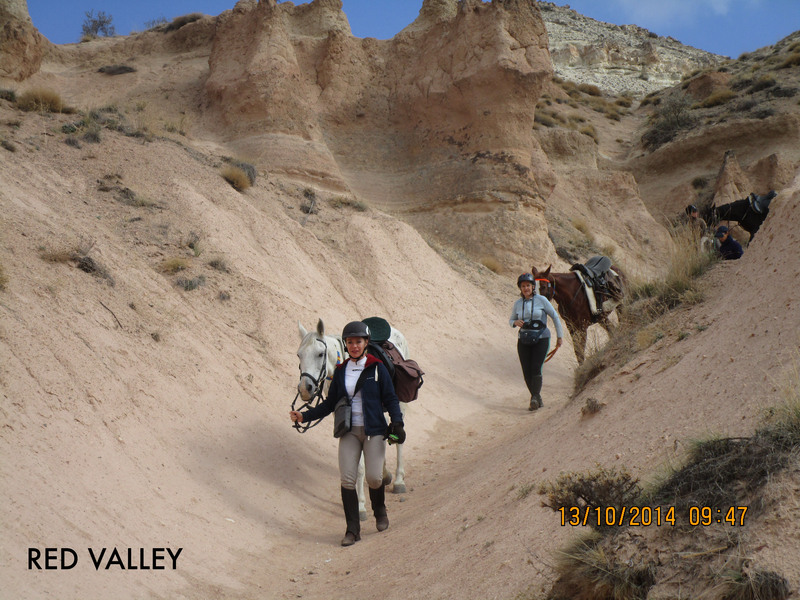 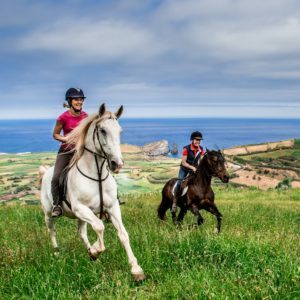 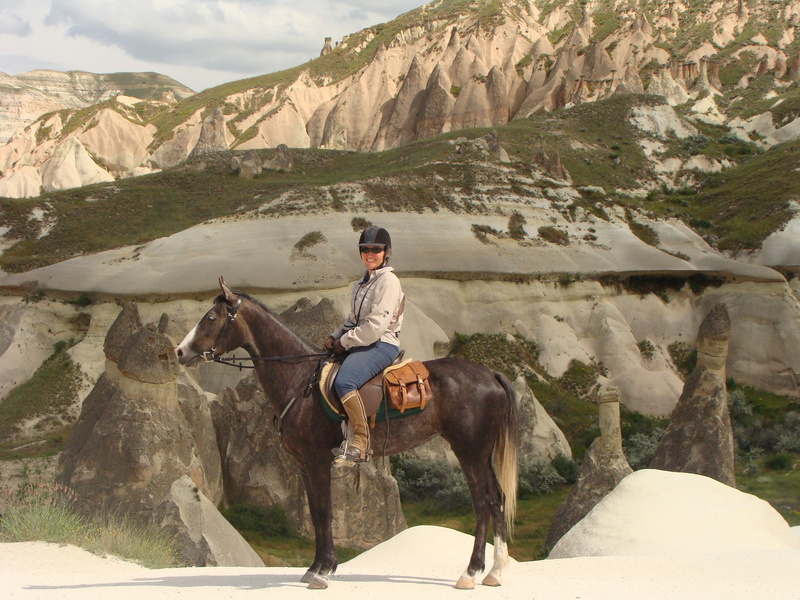 Today you ride from Cavusin to the magnificent Pasabagi Valley and on to Devrent Valley where you will have lunch and see wonderful examples of fairy chimneys and interesting geological rock formations. 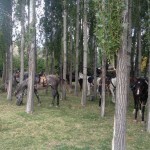 After breakfast at c. 9 am you will be met and transferred to the horses. 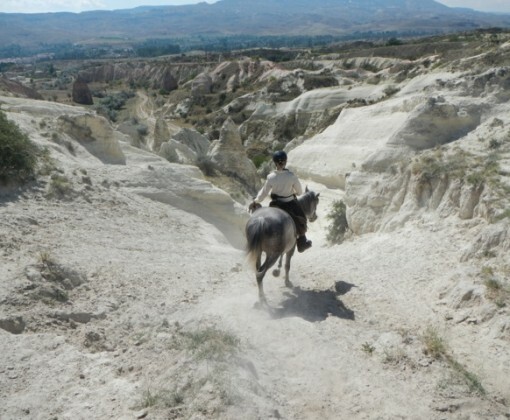 Today you will ride from Ortahisar to Mustafapasa, which was an old Greek village formerly known as Sinassos, to Gol Golu where many ancient Roman cave ruins can be seen. 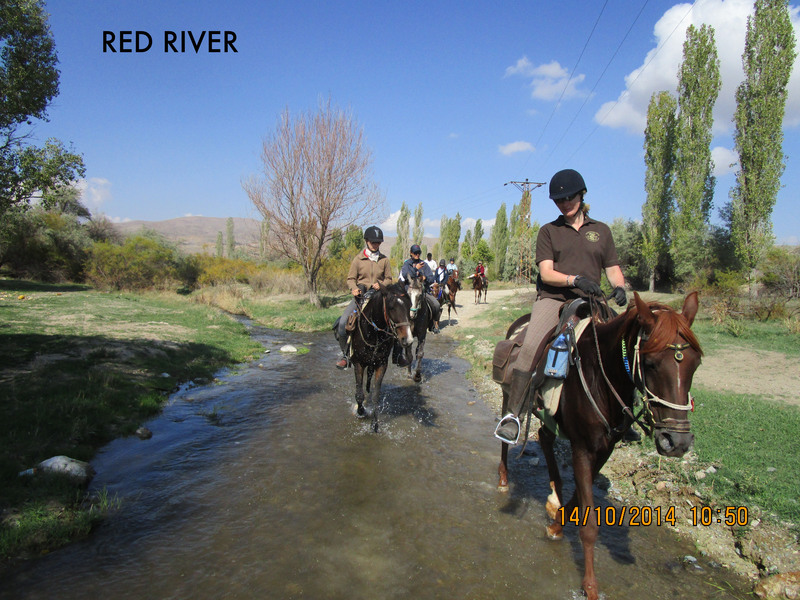 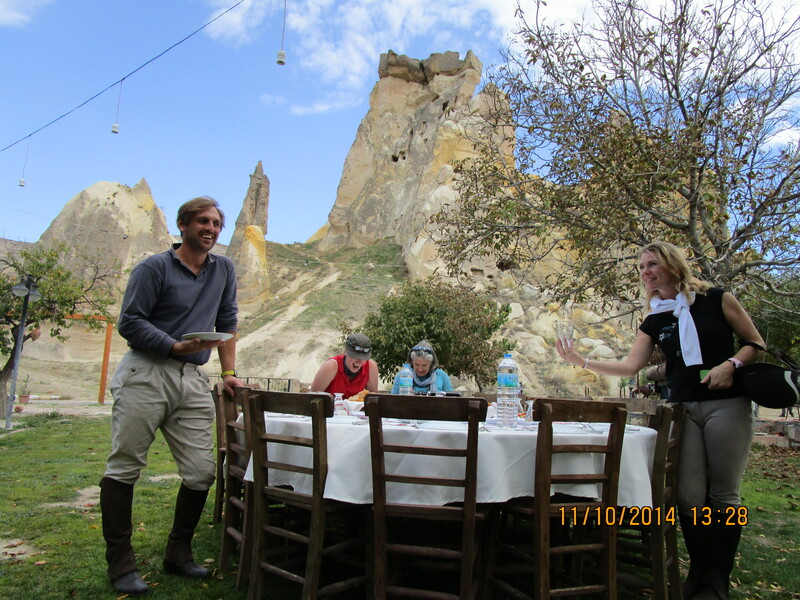 Stop for tea and then ride on through the Pancsarlik valleys to a trout farm where you have lunch. 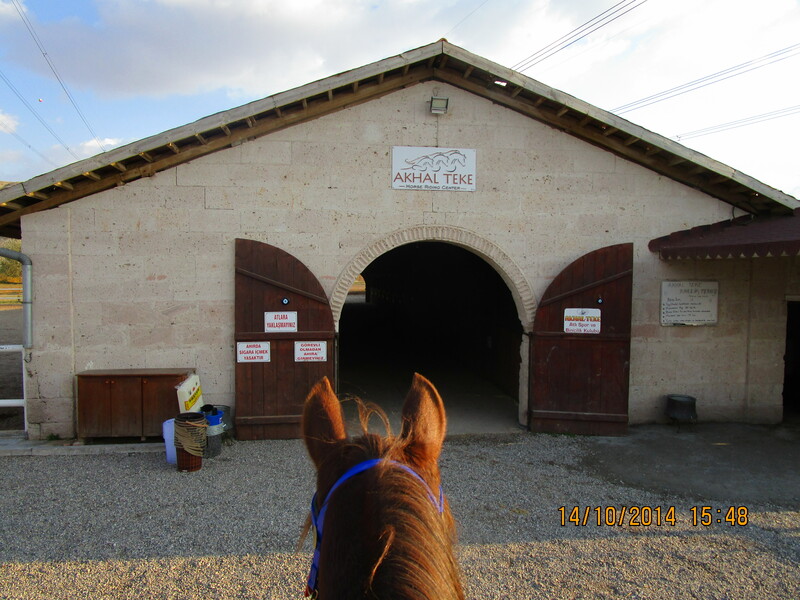 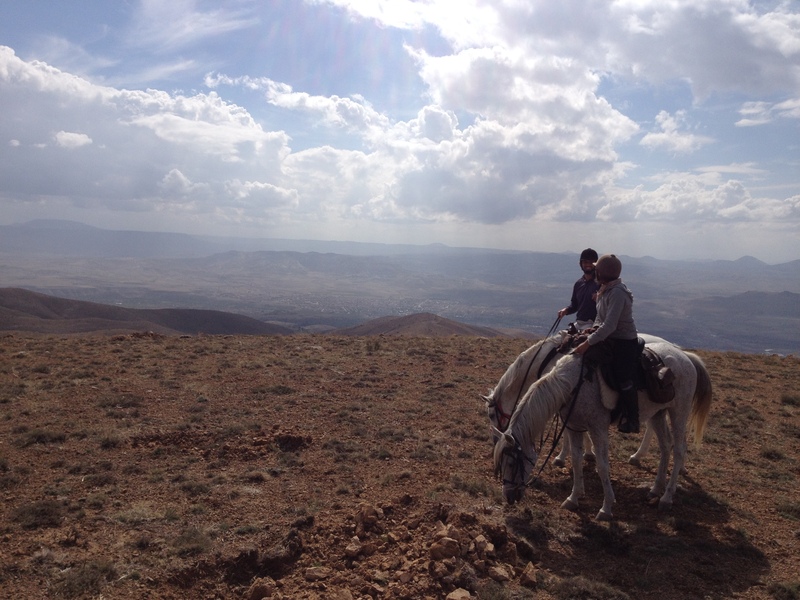 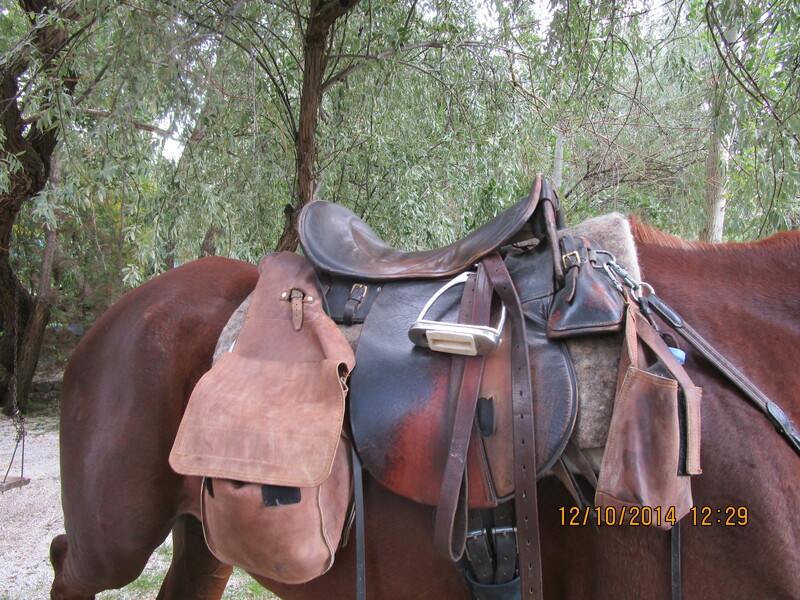 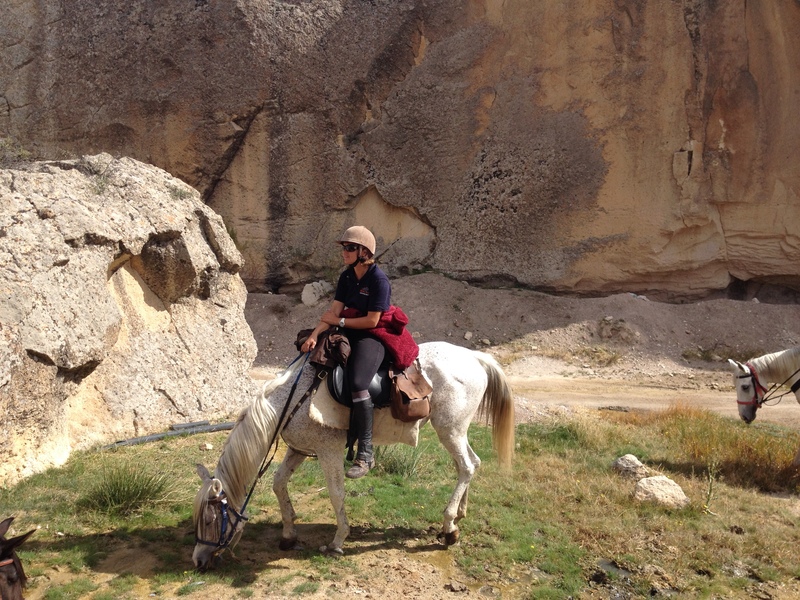 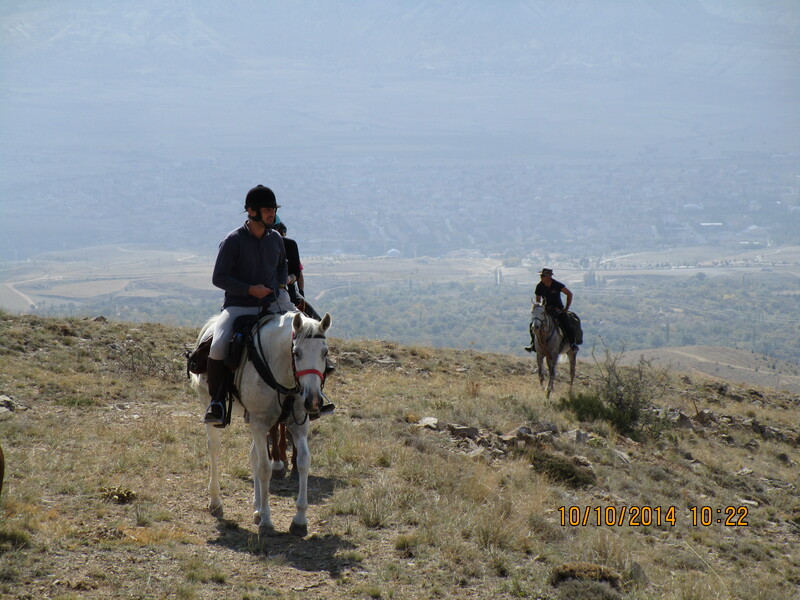 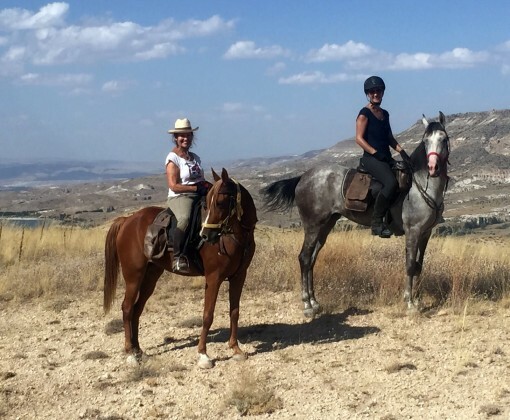 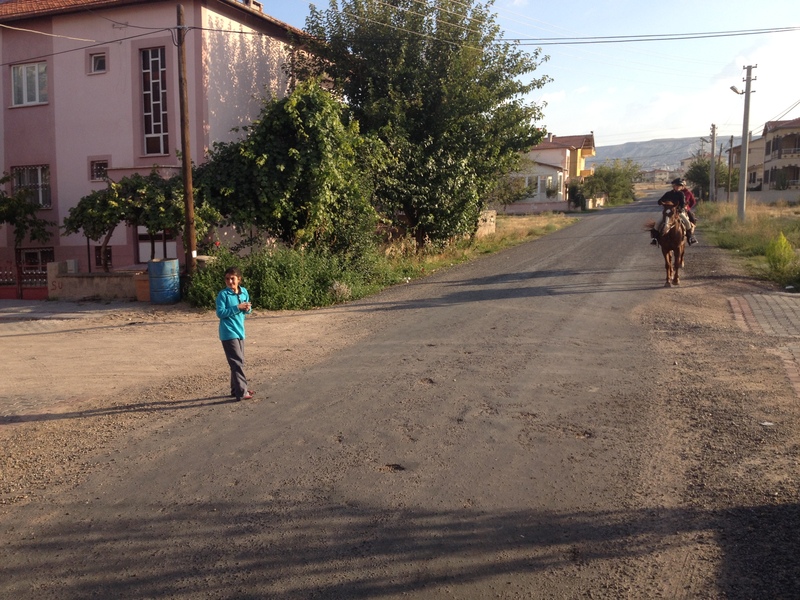 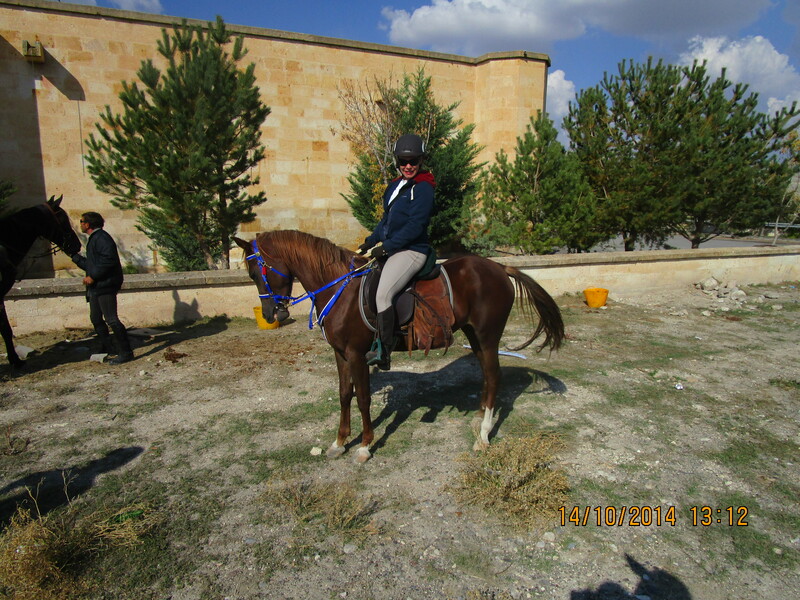 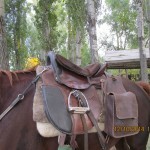 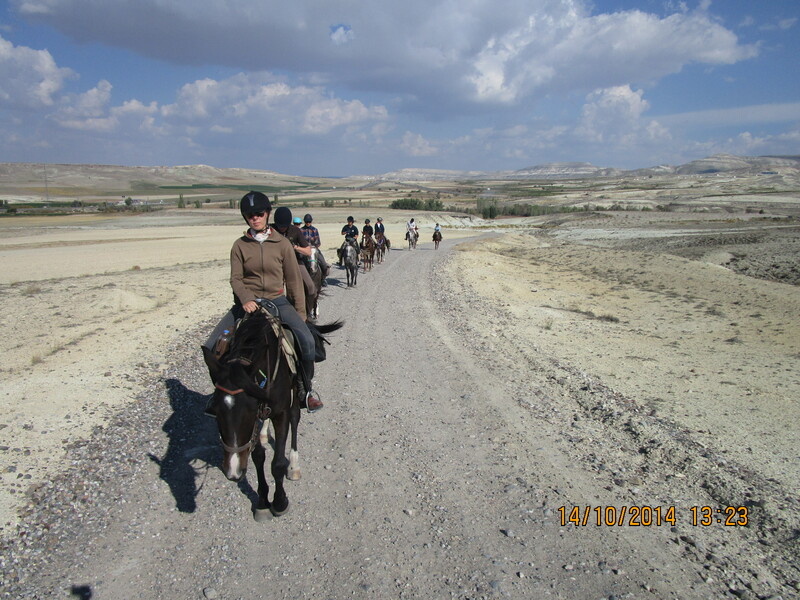 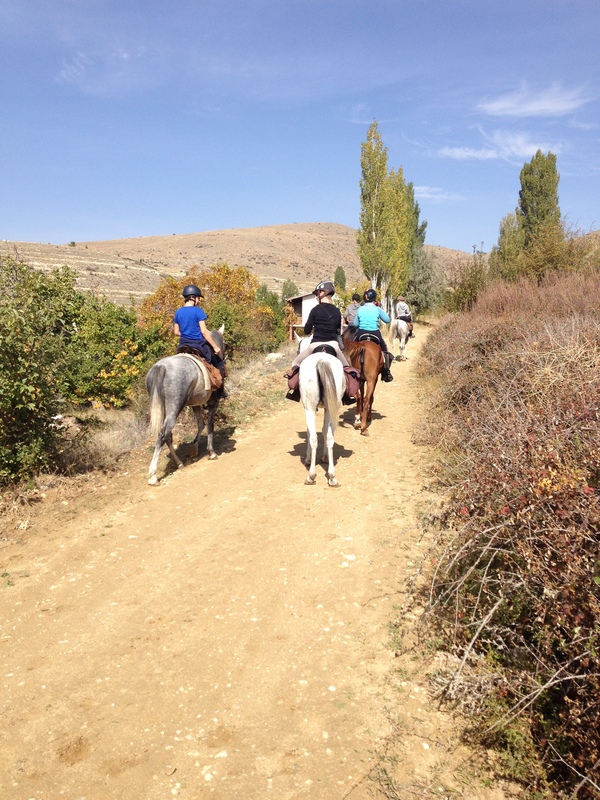 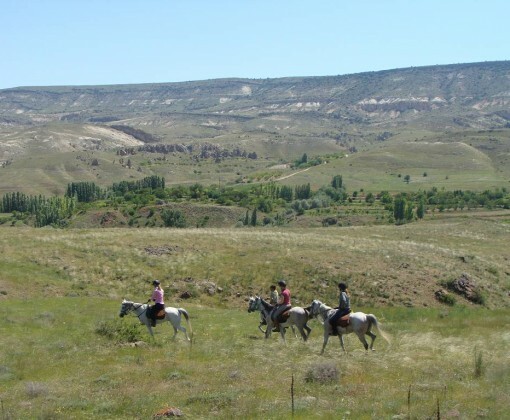 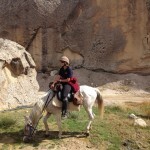 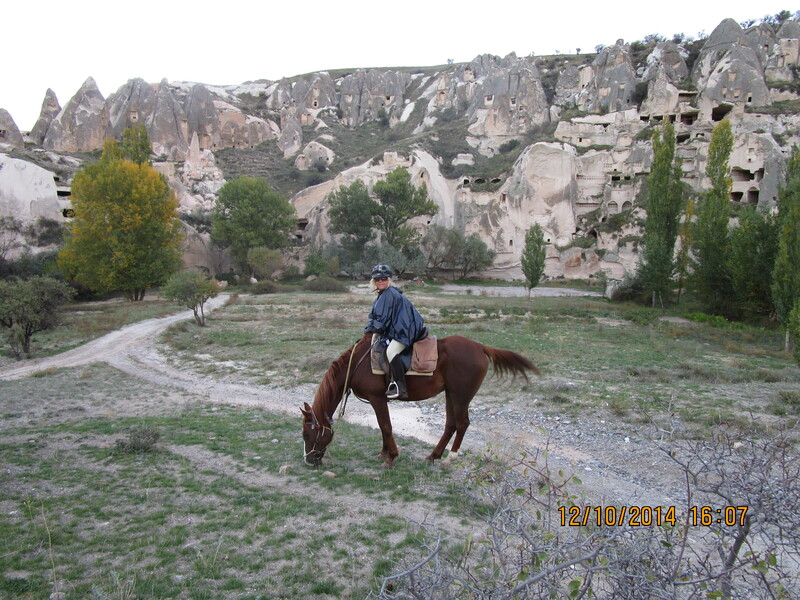 Today’s ride is from Ortahisar back to the stables in Avanos. 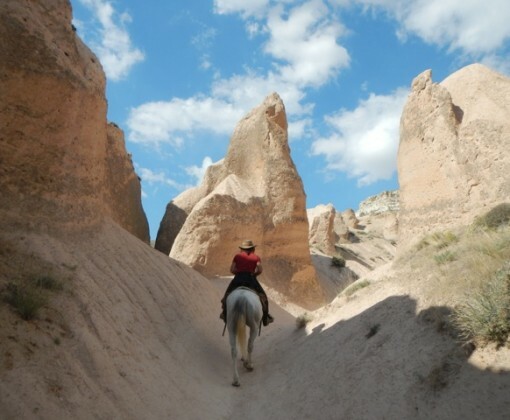 Pass through the stunning Rose and Red valley, where you can visit a hidden rock church. 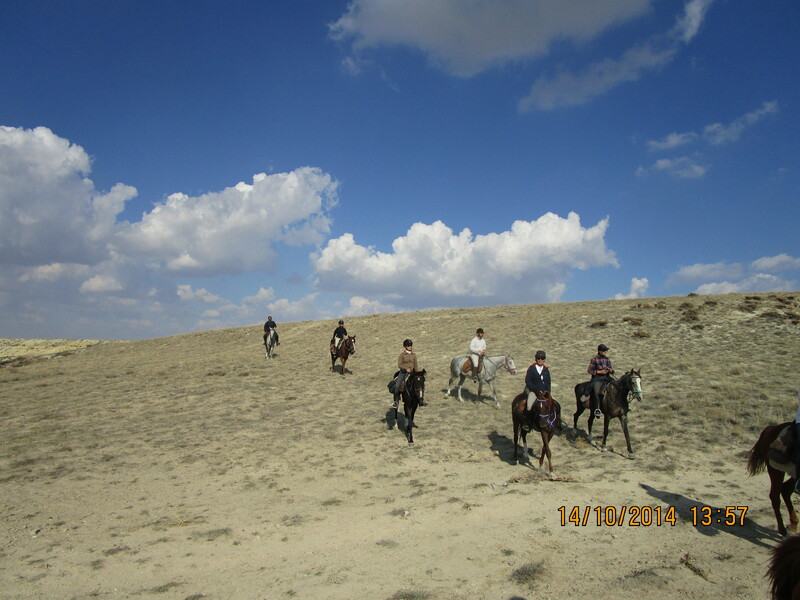 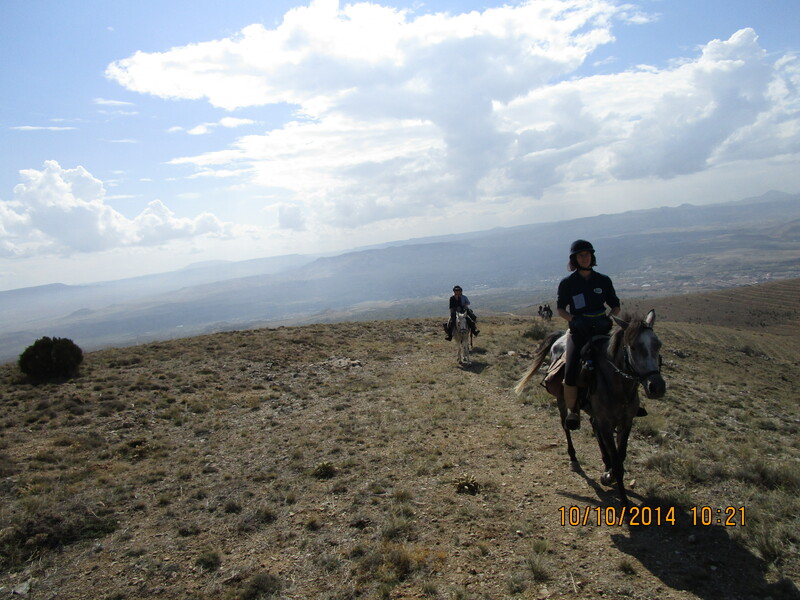 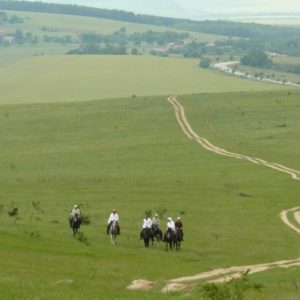 Once past the village of Cavusin there may be the opportunity for some faster riding across the open steppe. 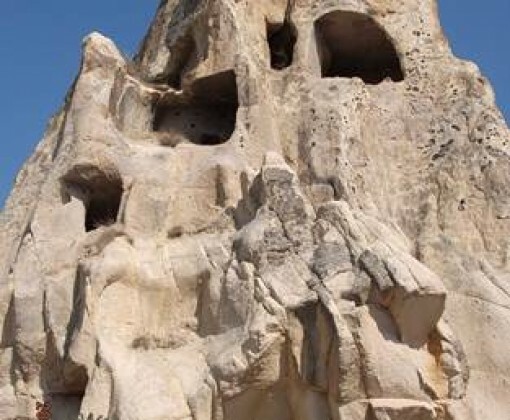 This evening, you will visit the Goreme Open Air museum. 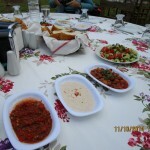 Breakfast at your hotel. 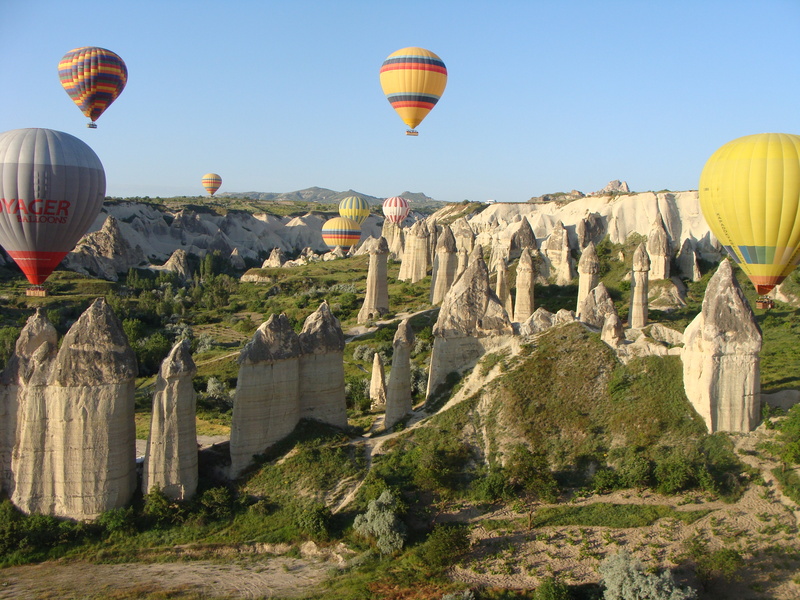 Transfer to Kayseri or Nevsehir for departure flights. 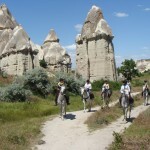 The Cappadocia Fairy Chimney Ride begins and ends in the historic town of Ortahisar in the heart of Cappadocia. 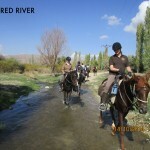 This ride takes you off the beaten path and allows you to explore the more remote valleys and villages where few tourists go. 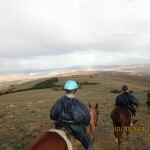 Please note that the four nights camping requires a minimum of four people to be booked onto the ride. 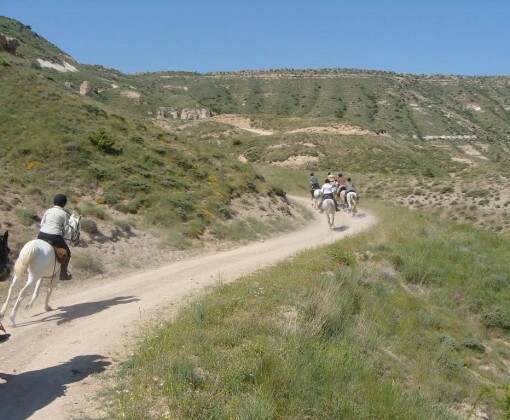 If this minimum has not been reached then you stay in hotel accommodation instead and are taken each day by vehicle to where the horses are left so that you will ride approximately the same route. 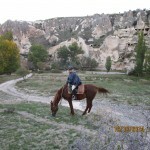 Normally you stay in the Queens Cave Hotel when in Ortahisar but on occasions we do use other hotels. 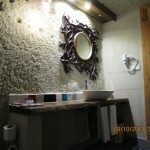 All hotels used are of the same standard. 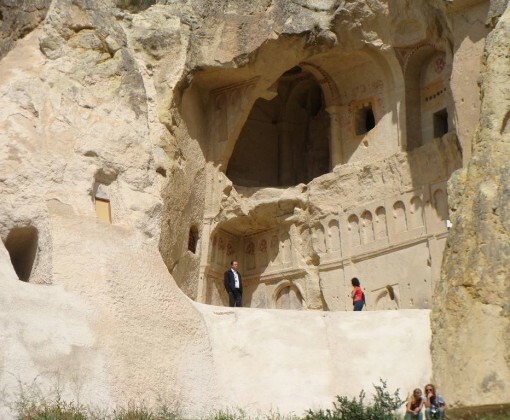 There is an opportunity to visit the Göreme Open Air Museum to see the awe-inspiring painted churches built by exiled Christians during the Roman era as well as watch Dervishes perform their rituals in a 13th Century Caravansarai. 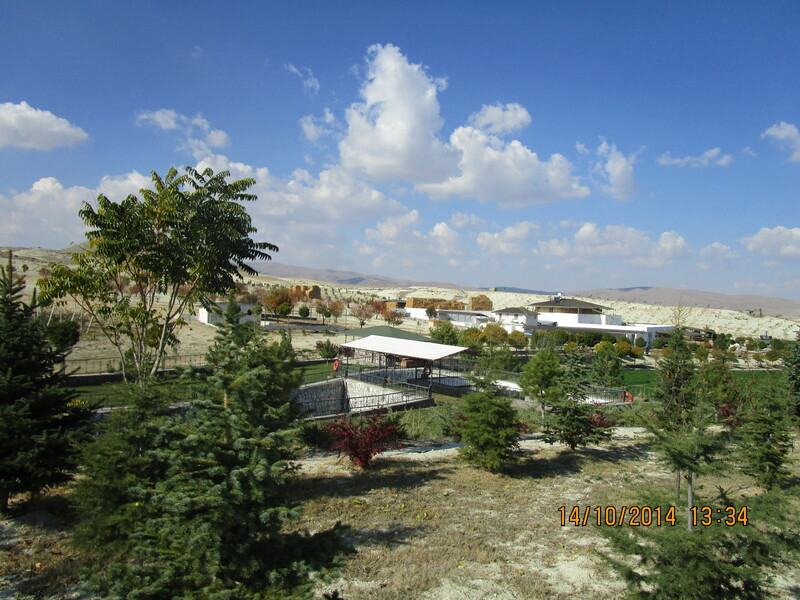 Arrival at Nevsehir or Kayseri Airport. 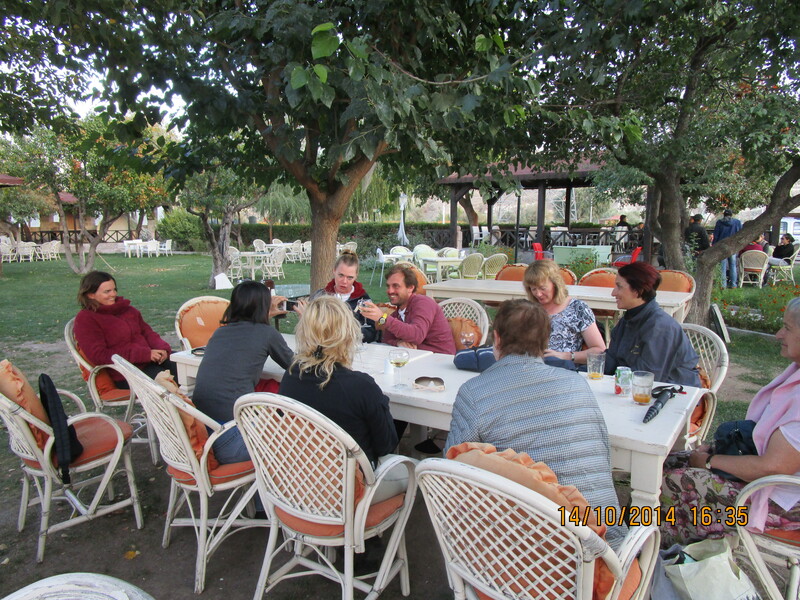 Transfer and check in at the hotel in Ortahisar. 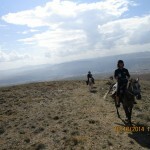 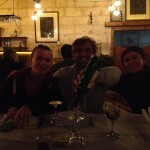 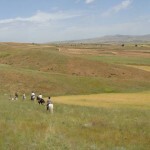 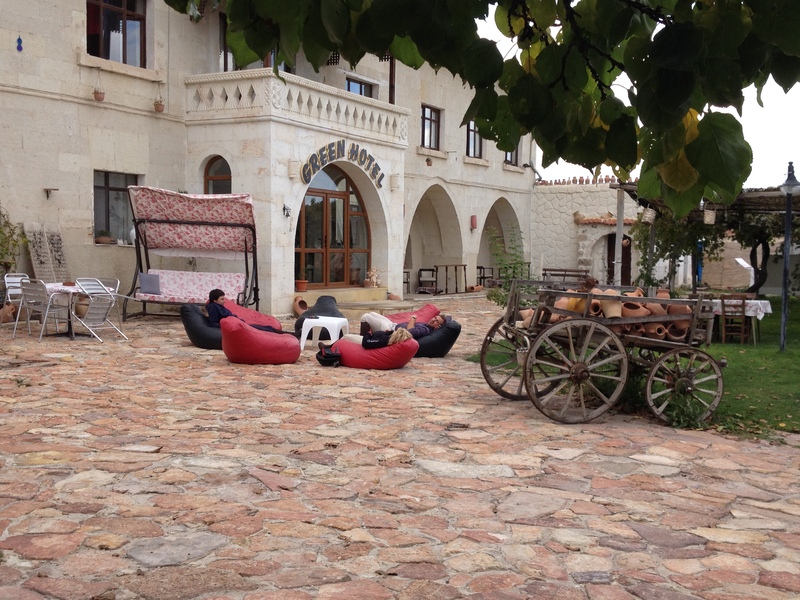 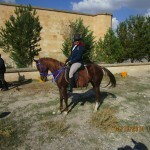 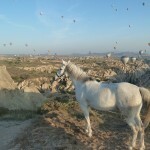 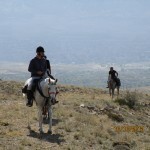 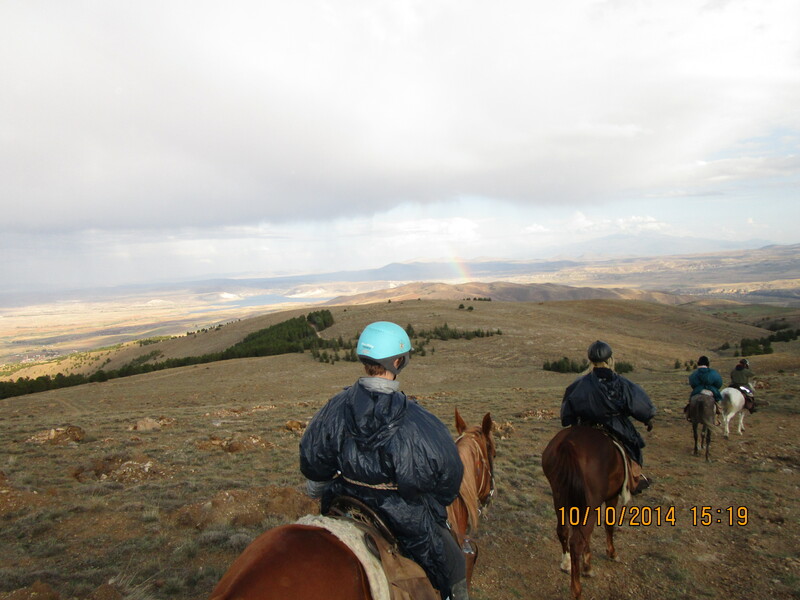 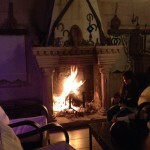 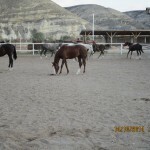 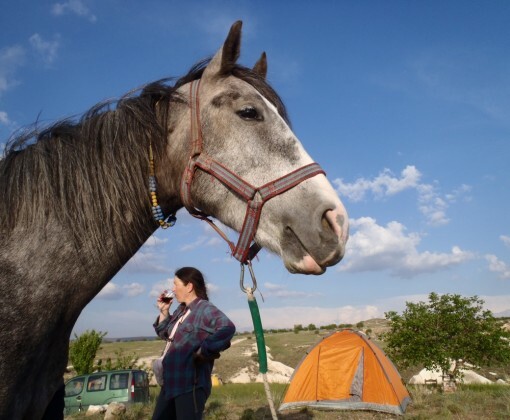 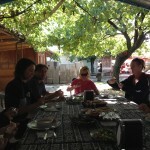 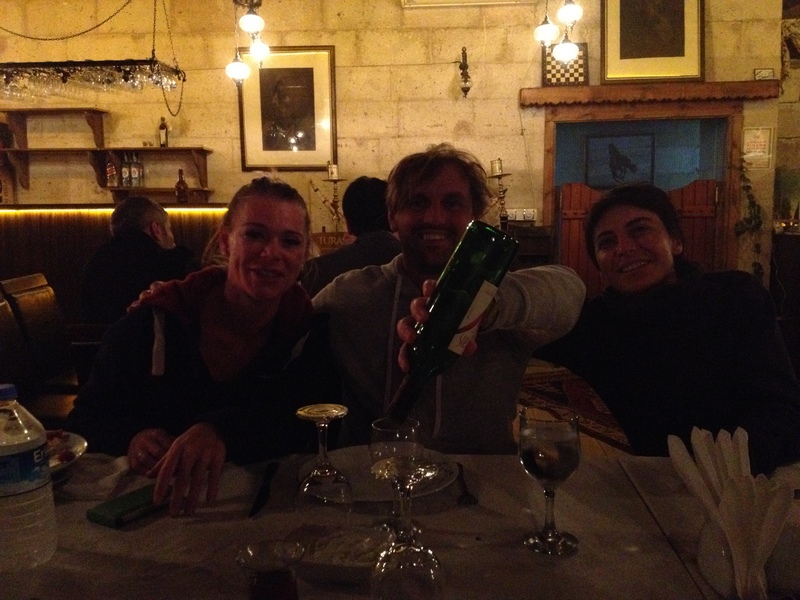 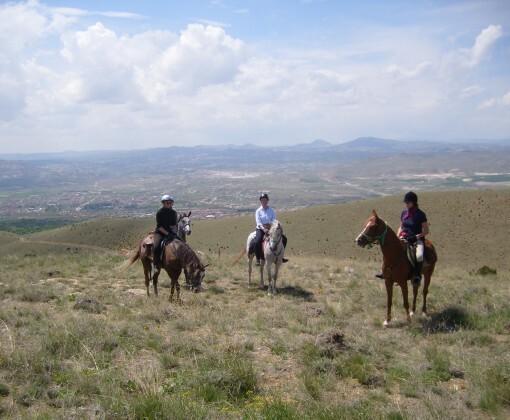 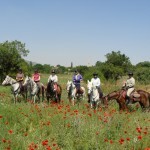 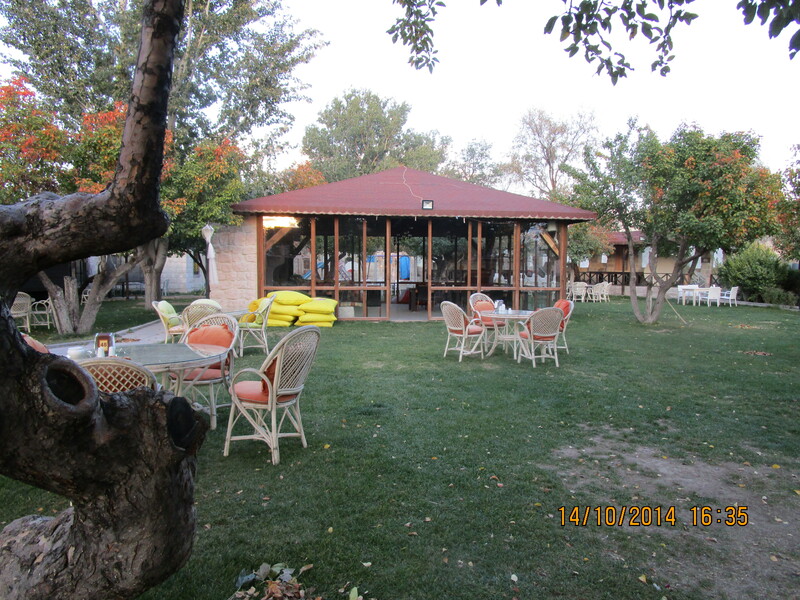 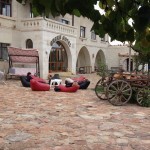 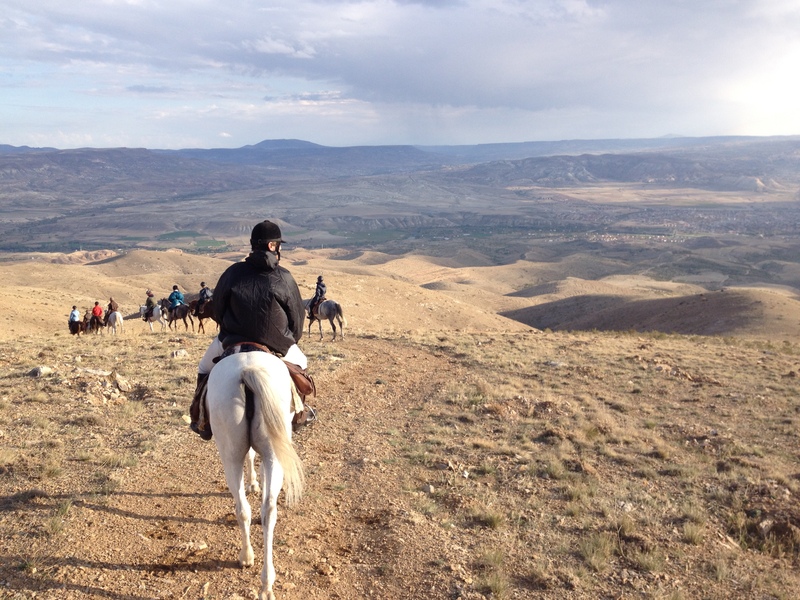 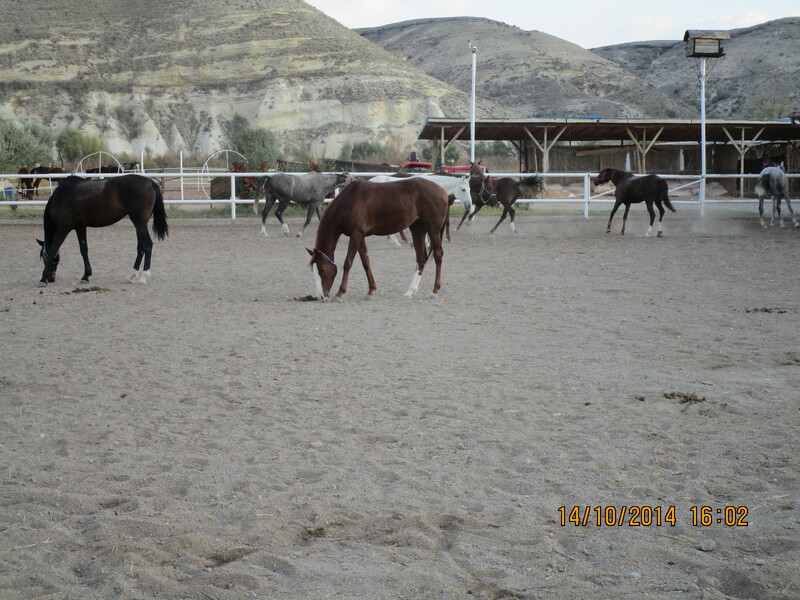 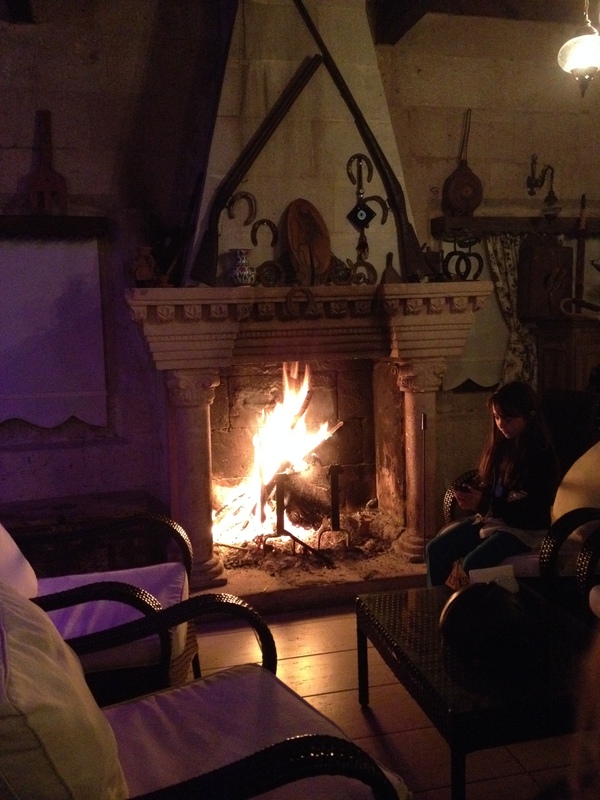 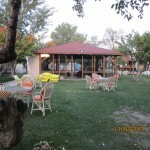 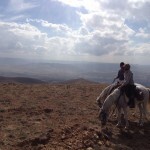 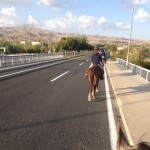 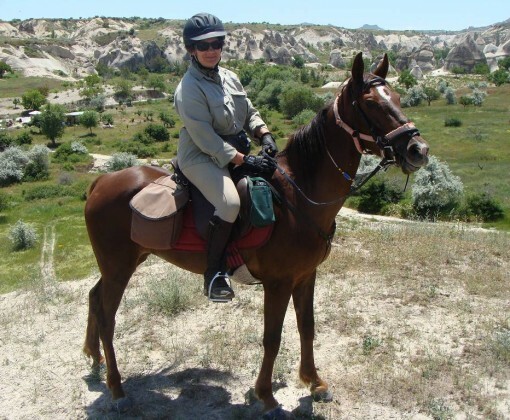 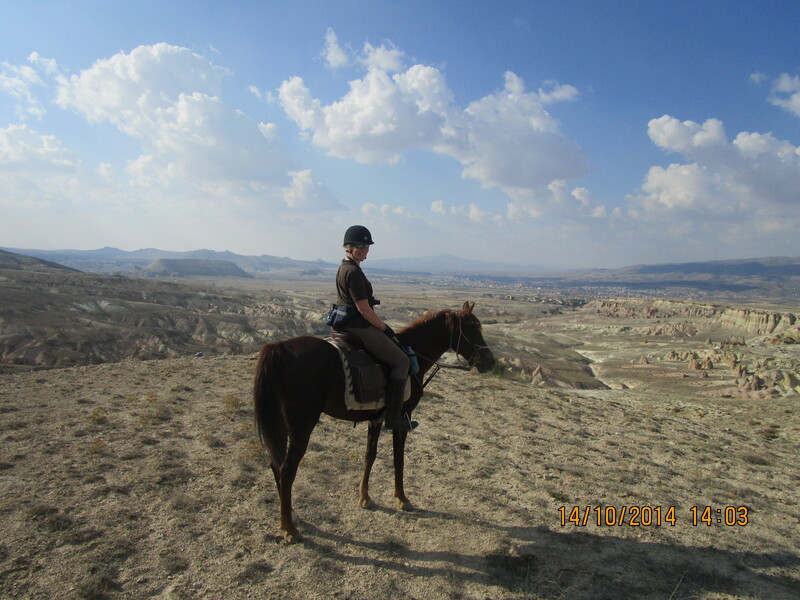 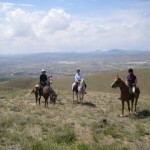 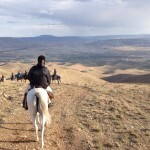 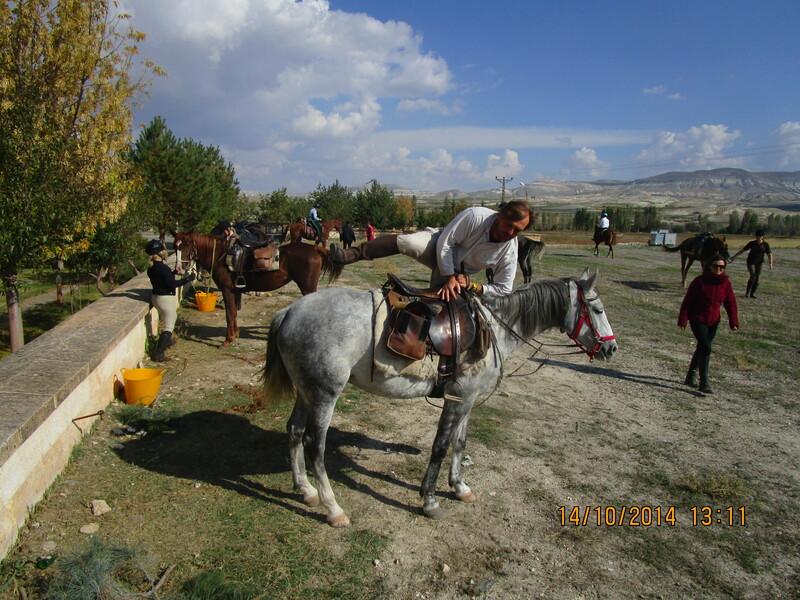 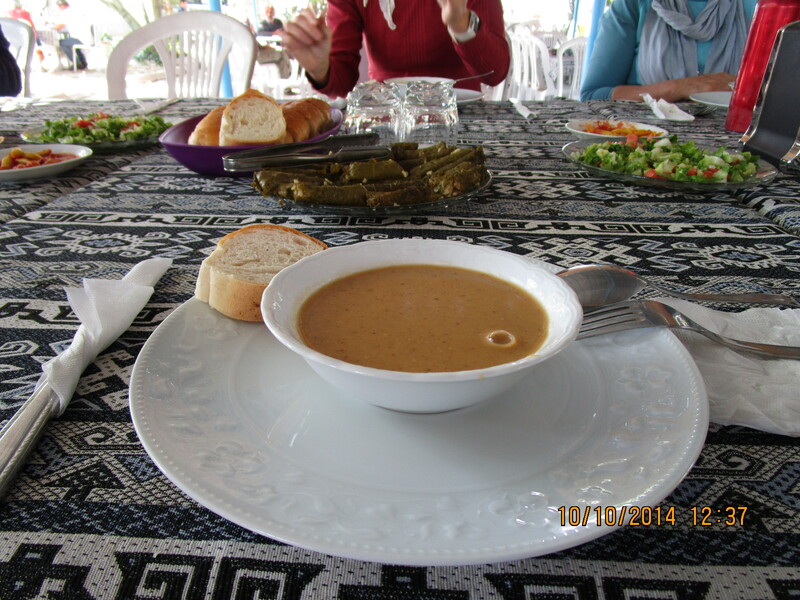 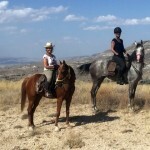 Dinner and overnight in Ortahisar or at the riding centre. 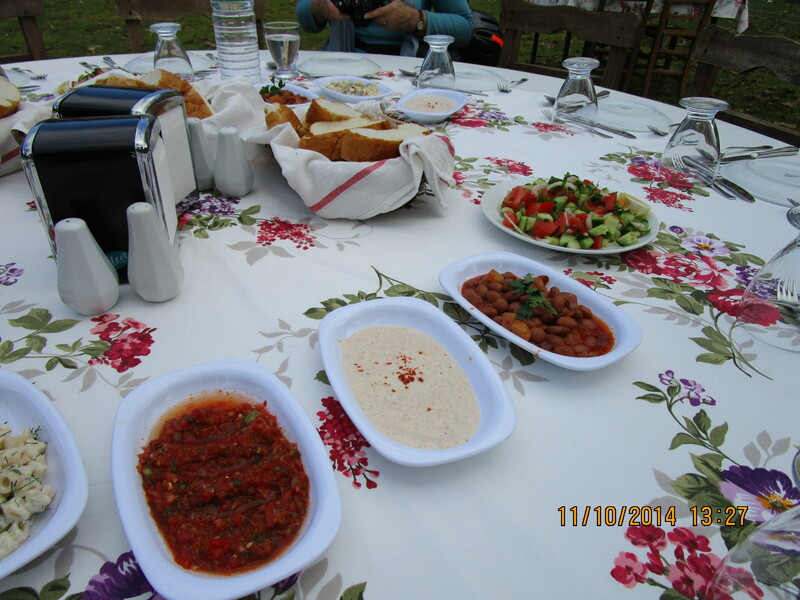 Breakfast at your hotel at 8 am. 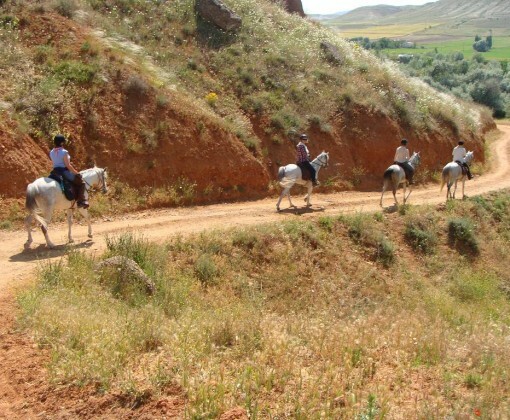 After breakfast at c. 9 am you will be met and transferred to the stables by vehicle. 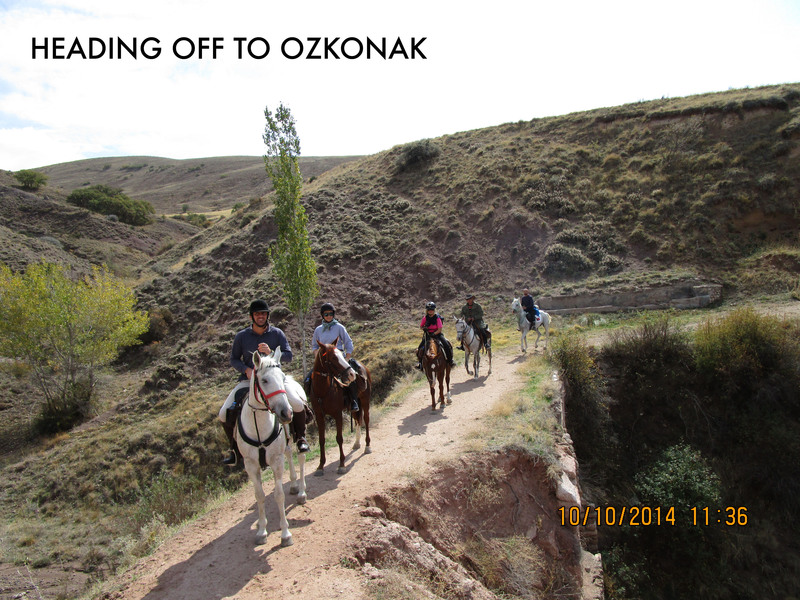 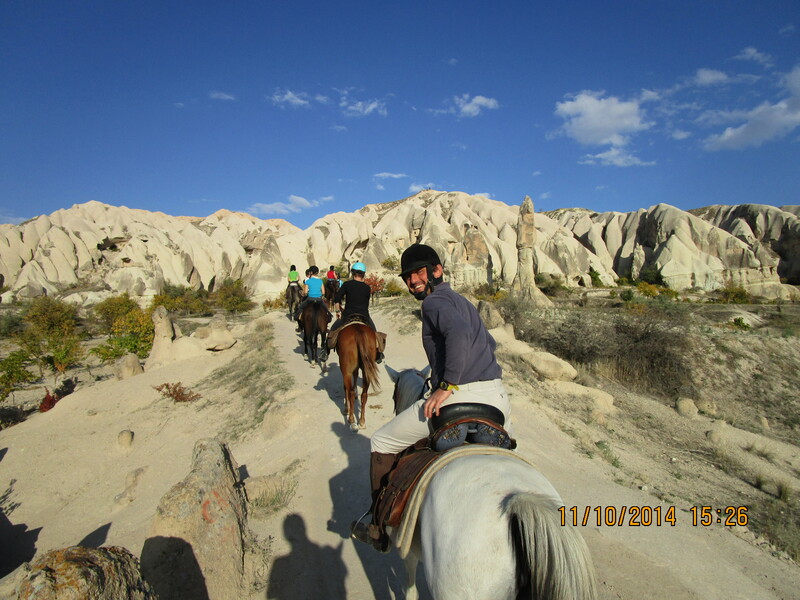 Today you ride from Avanos to Ozkonak where you will visit one of Cappadocia ́s largest underground cities. 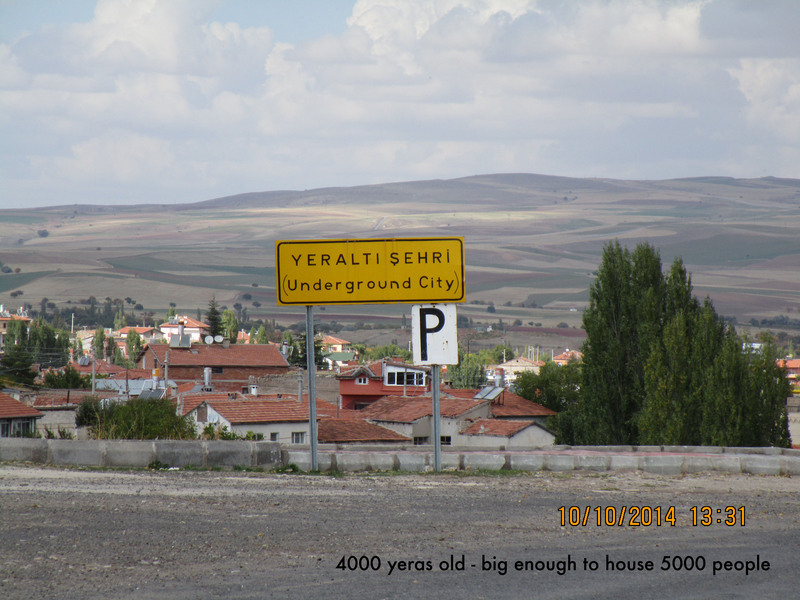 When excavated, the city revealed ten floors that could have housed 60,000 people for three months at a time. 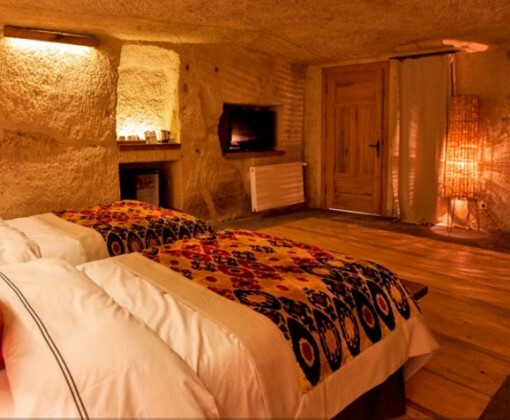 You can only visit the first four floors. 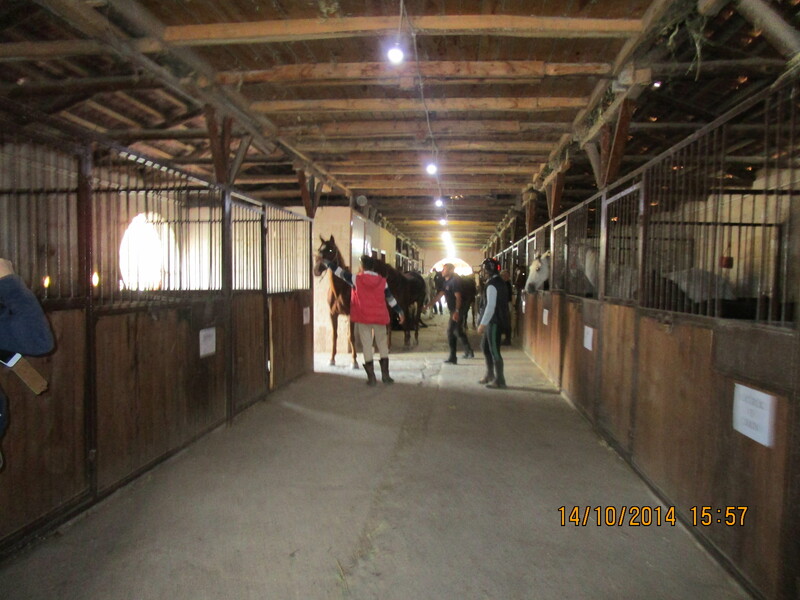 After breakfast at c. 9 am you will be met and transferred to the horses. 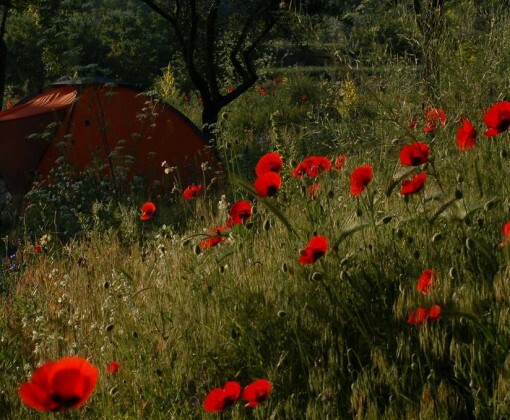 Remember to pack your bags as tonight will be your first camping night. 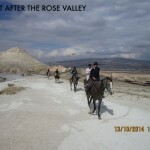 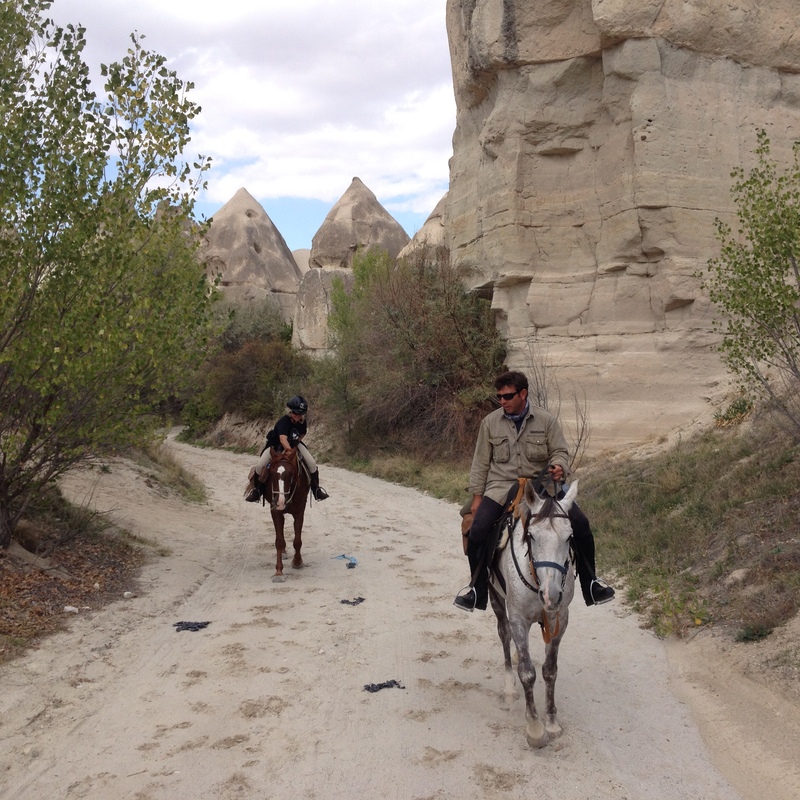 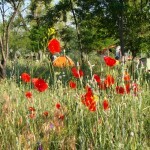 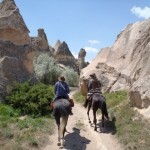 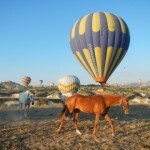 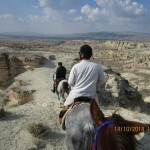 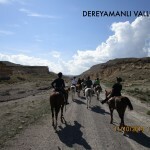 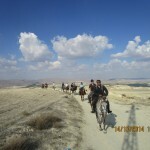 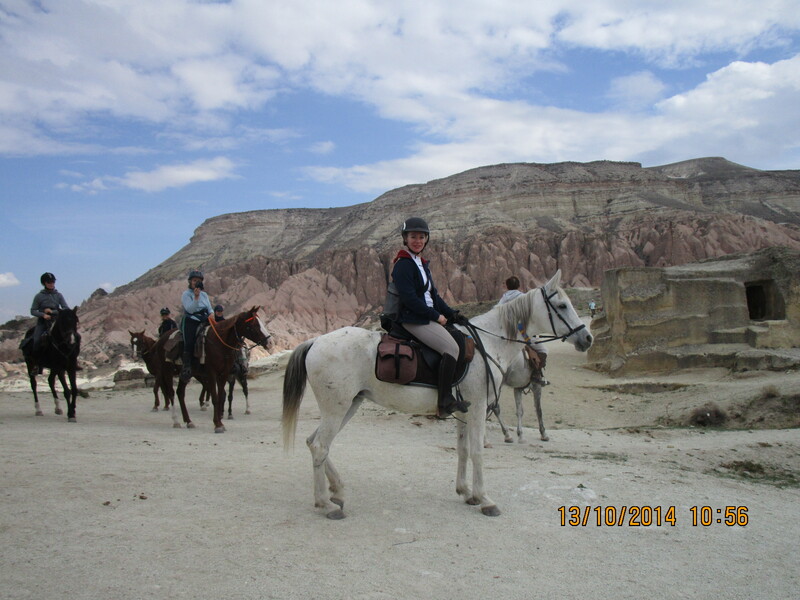 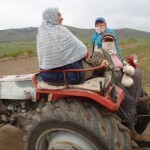 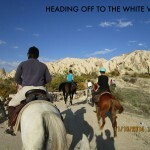 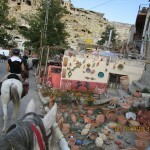 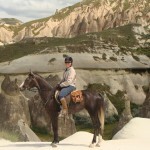 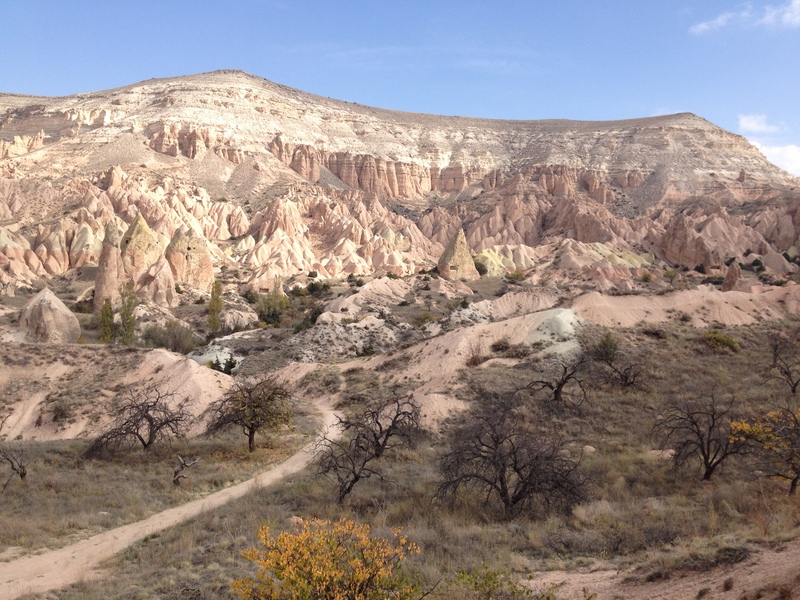 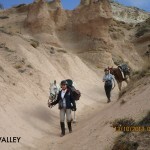 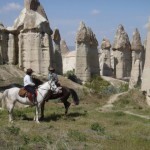 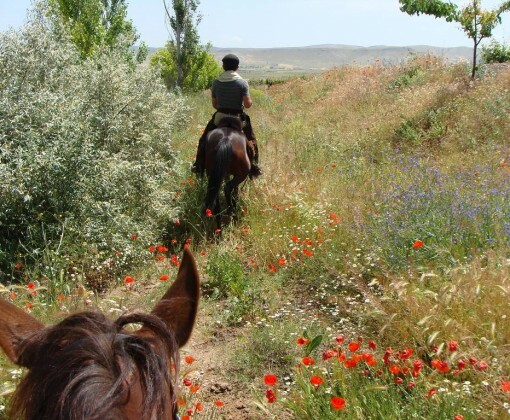 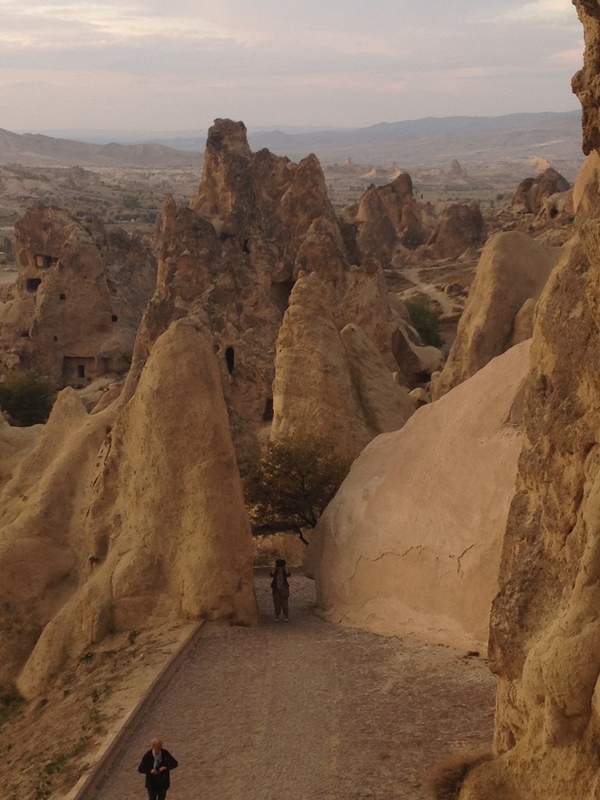 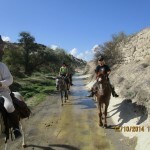 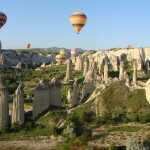 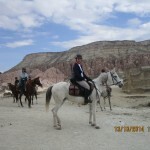 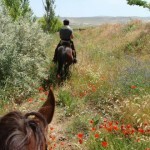 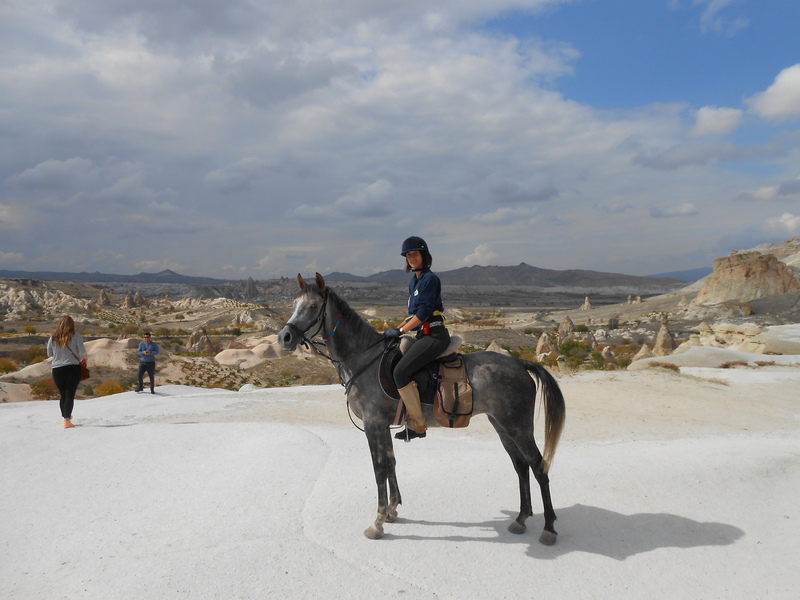 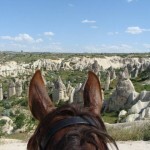 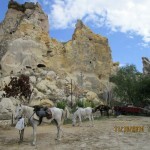 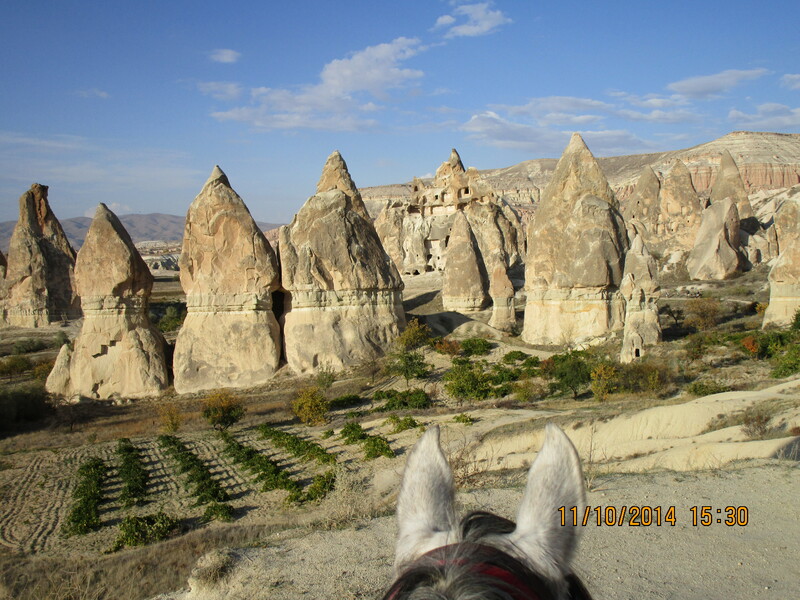 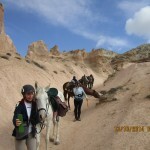 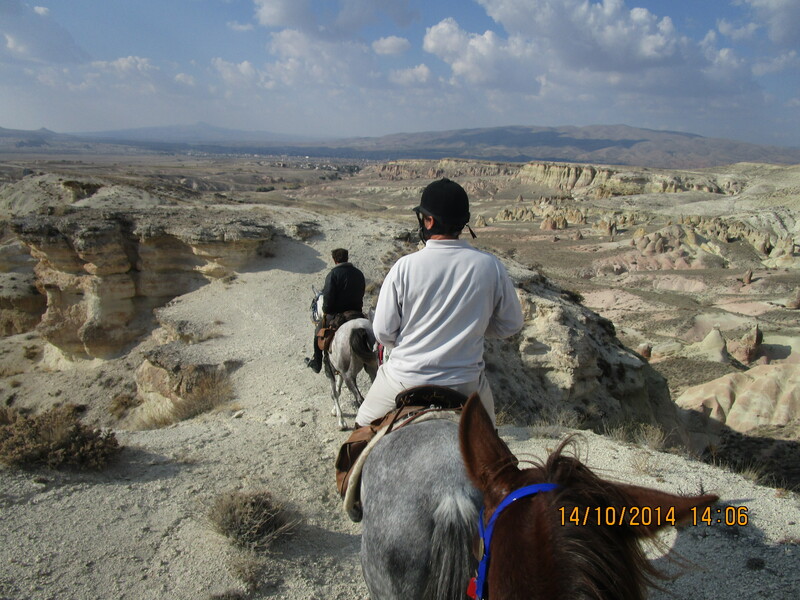 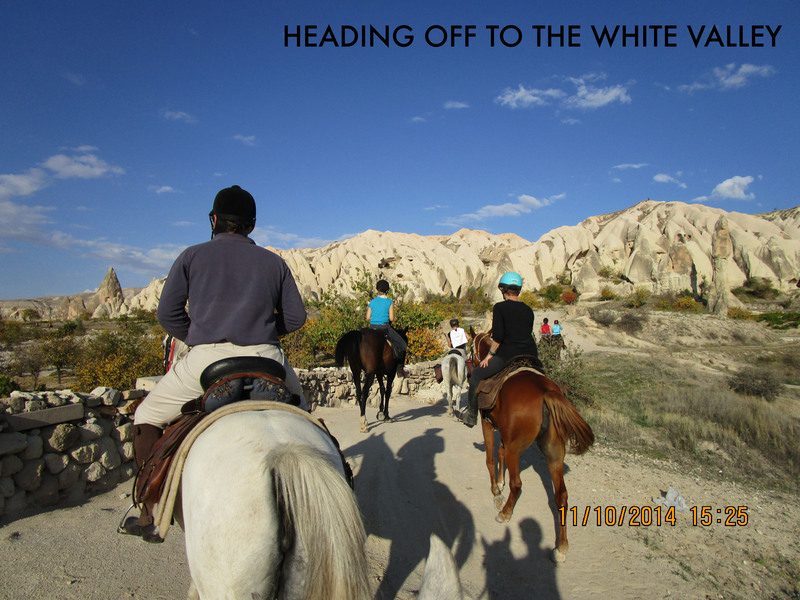 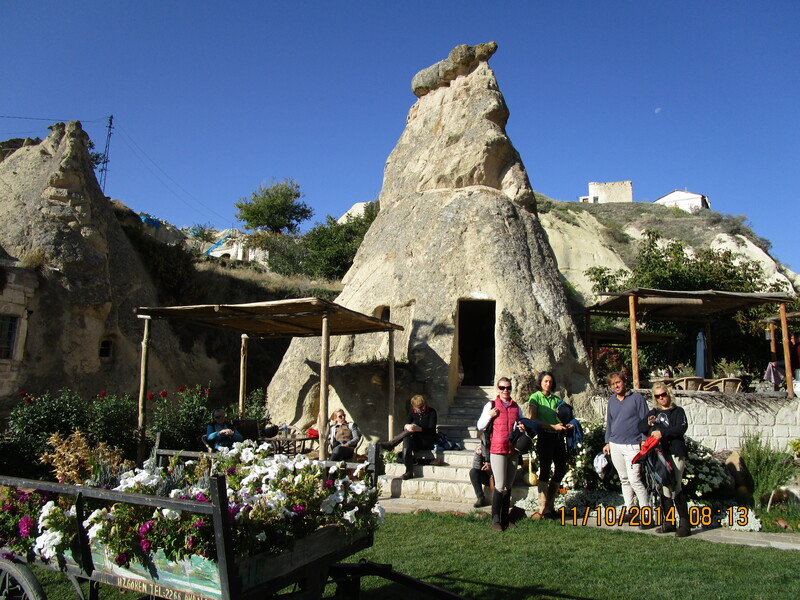 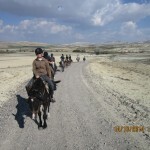 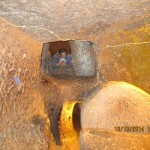 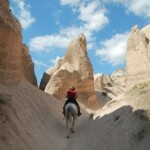 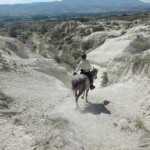 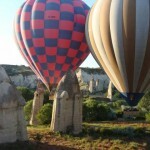 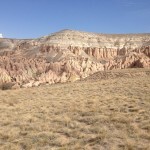 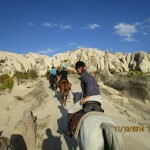 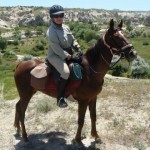 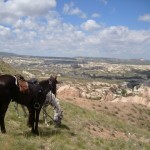 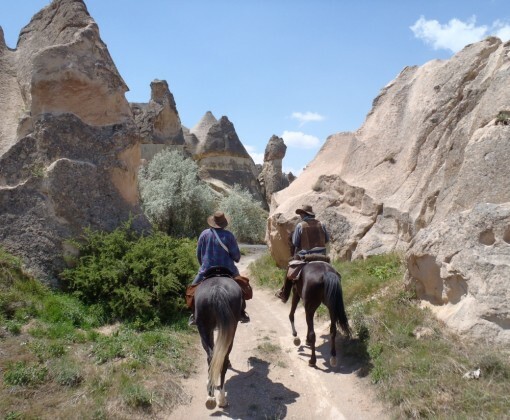 You will ride through Dereyamanli and on through the tranquil White Valley for lunch amongst the famed fairy chimneys. 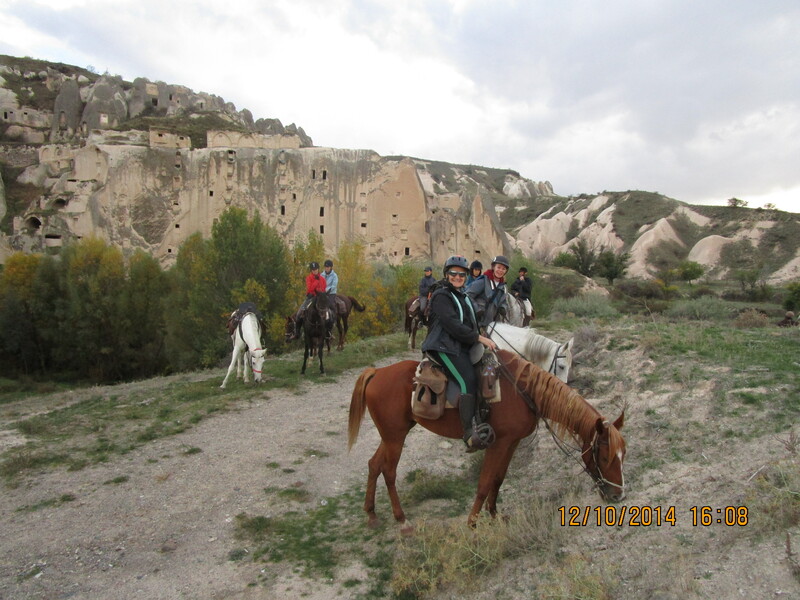 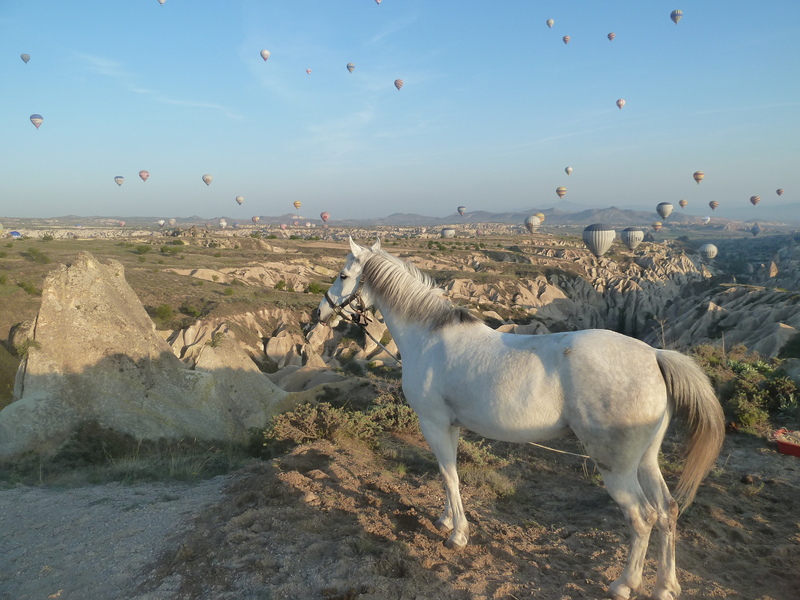 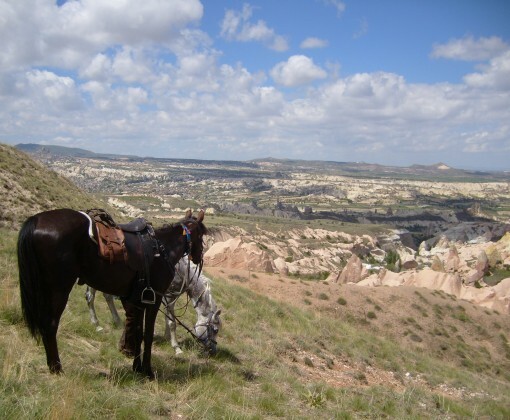 After lunch you will ride across the Göreme Valley where you can look out onto the Rose and Red Valley until reaching the old fortress town of Ortahisar. 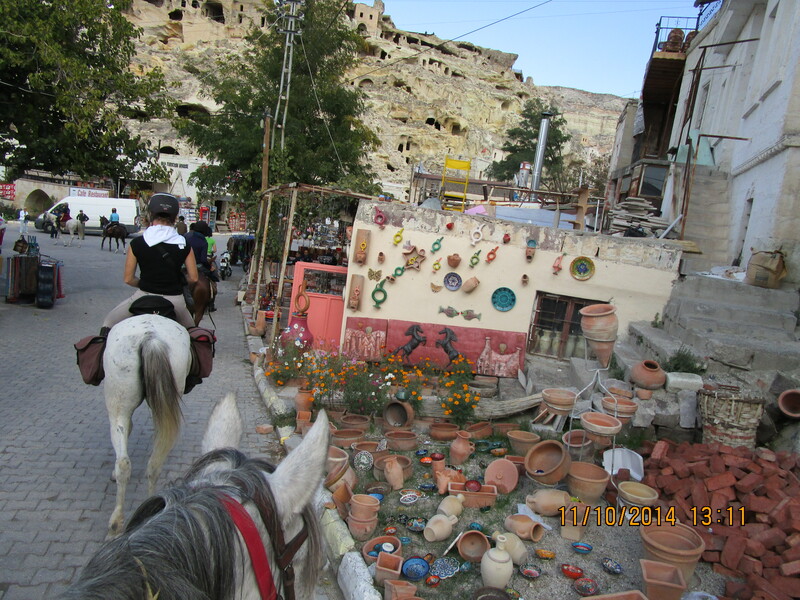 Today you ride from Ortahisar to Mustafapasa, which was an old Greek village formerly known as Sinassos. 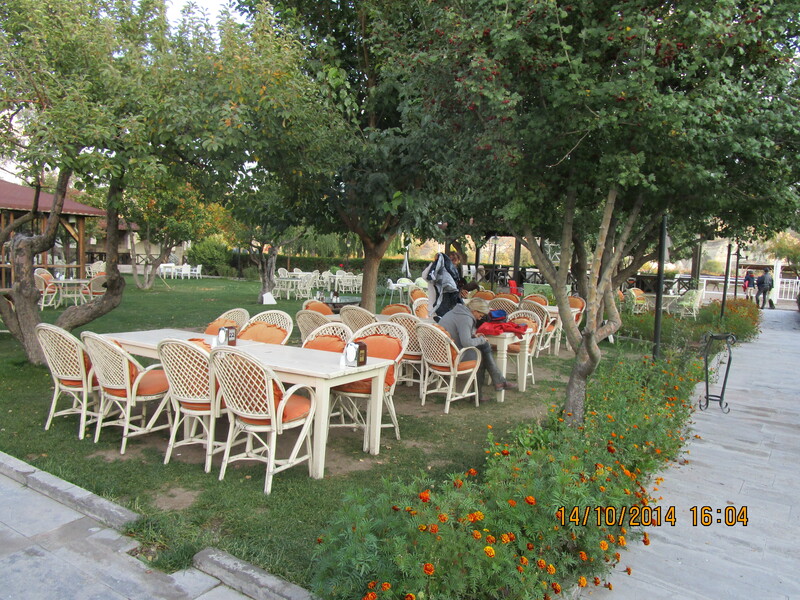 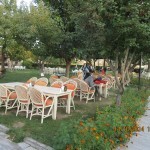 Stop for tea and then ride on to the quiet village of Ayvali and then onto a shaded trout farm where you have lunch. 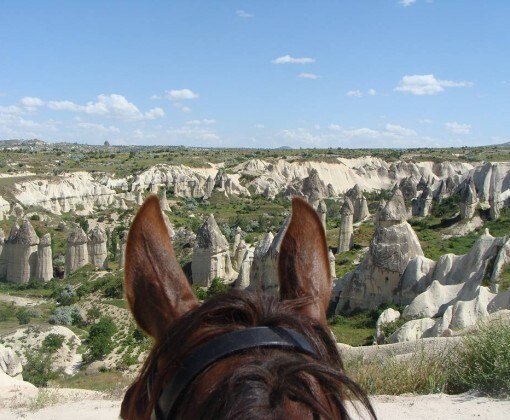 This morning your ride will take you through the Cemil Valley across the plateau and then through the valleys filled with Cappadocia’s famed fairy chimneys. 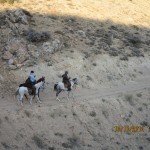 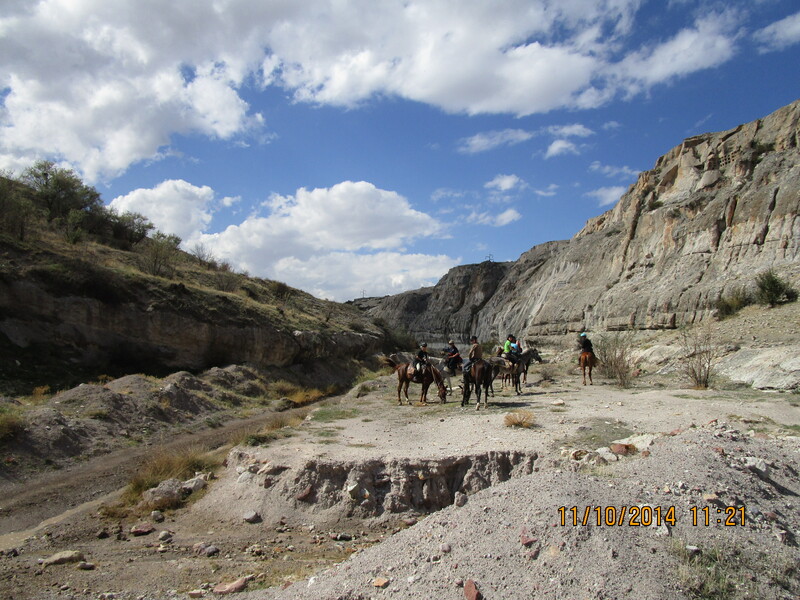 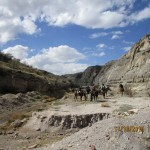 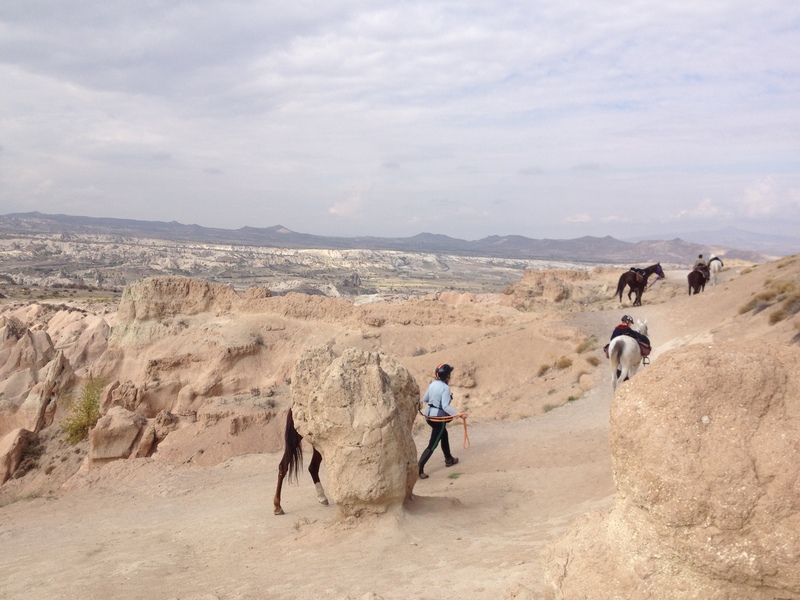 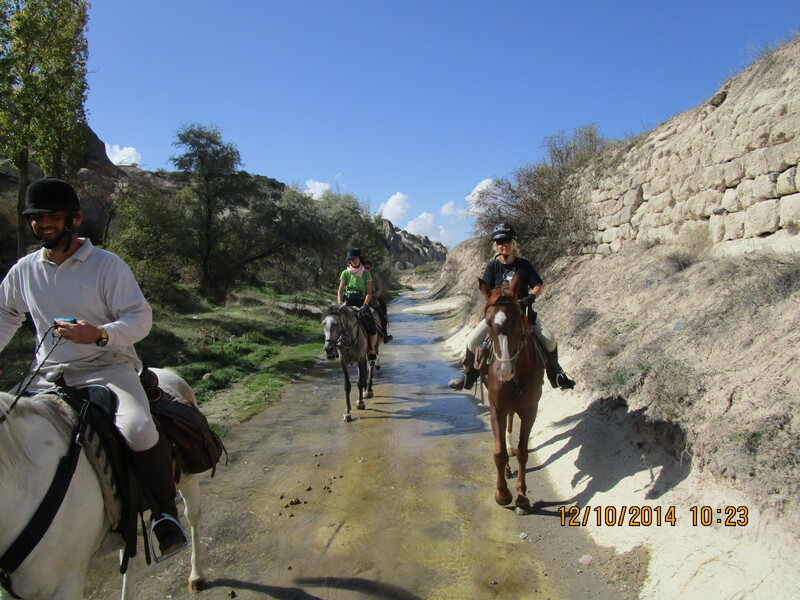 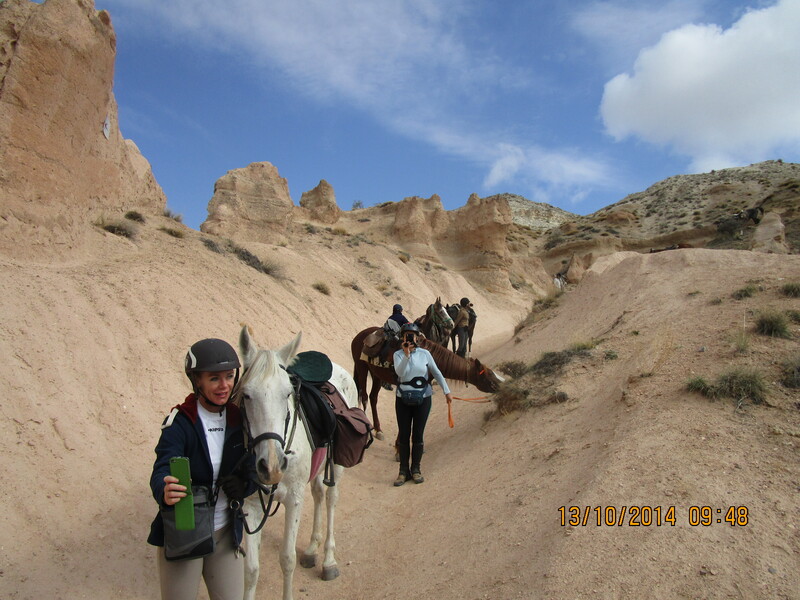 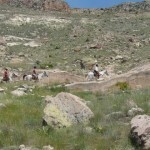 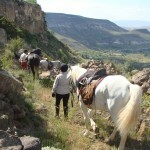 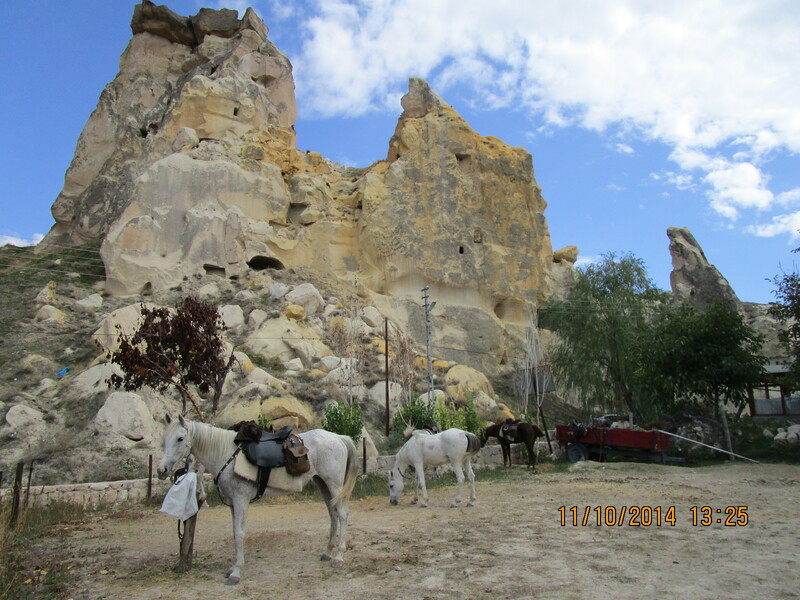 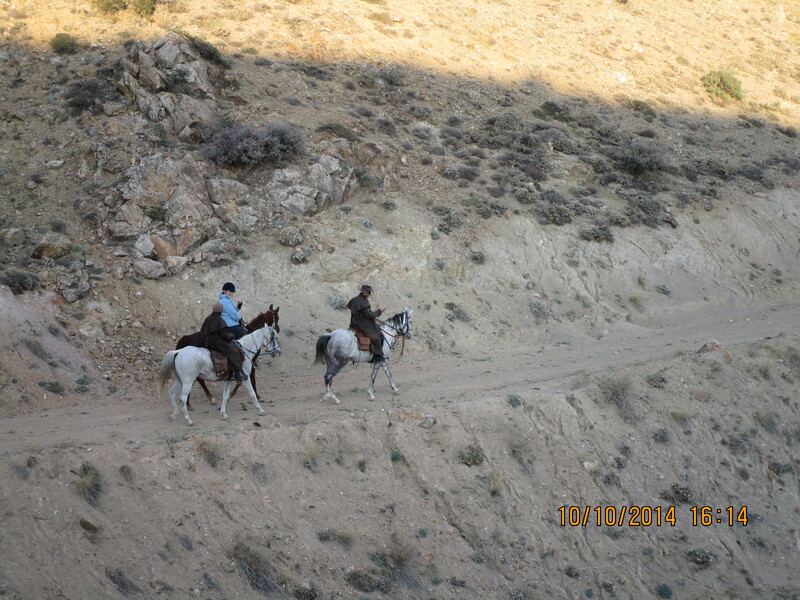 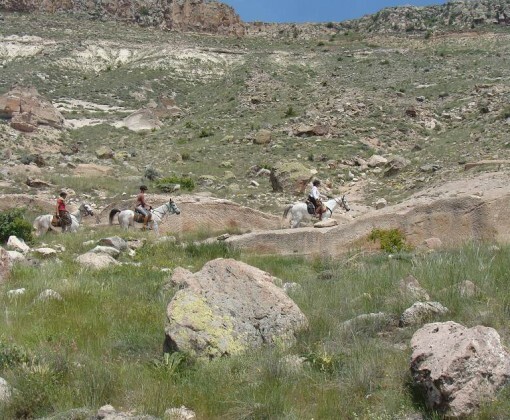 The horses scramble down a dramatic canyon to the village of Taskinpasa. 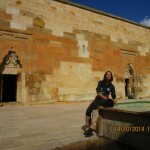 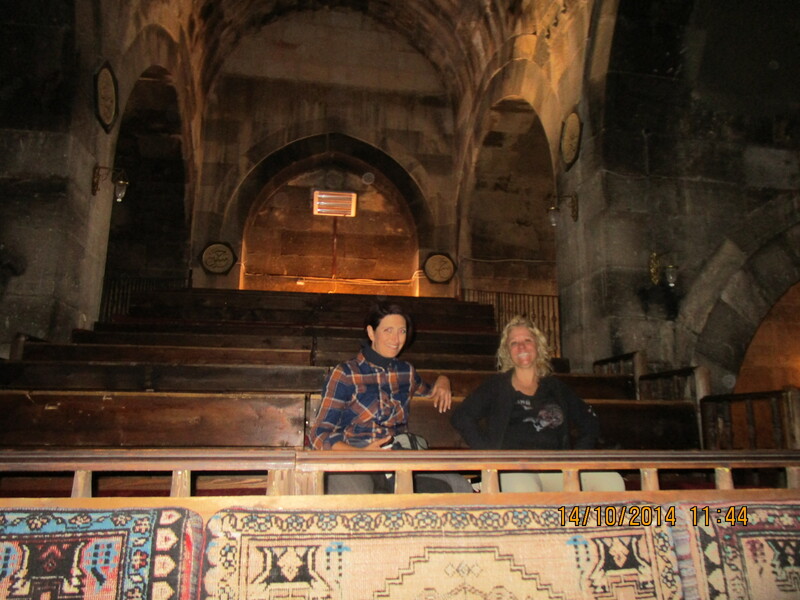 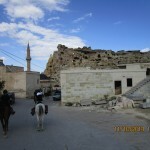 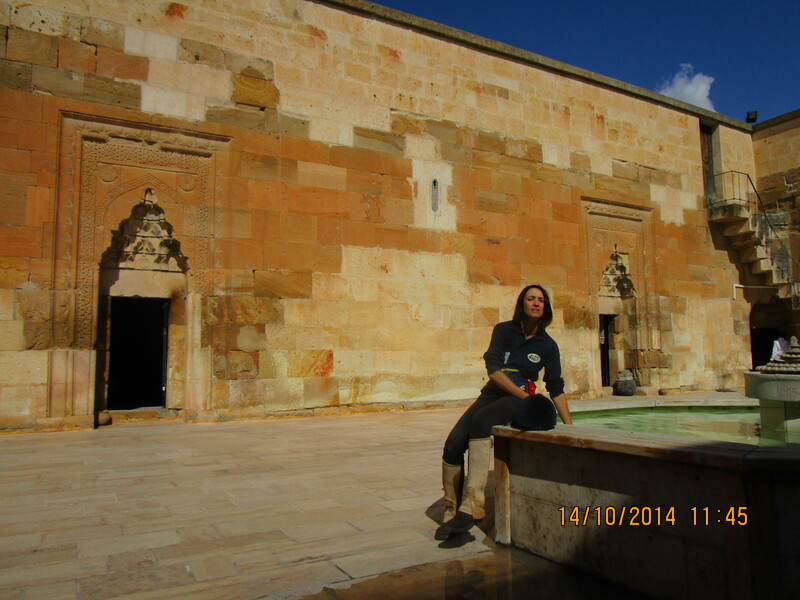 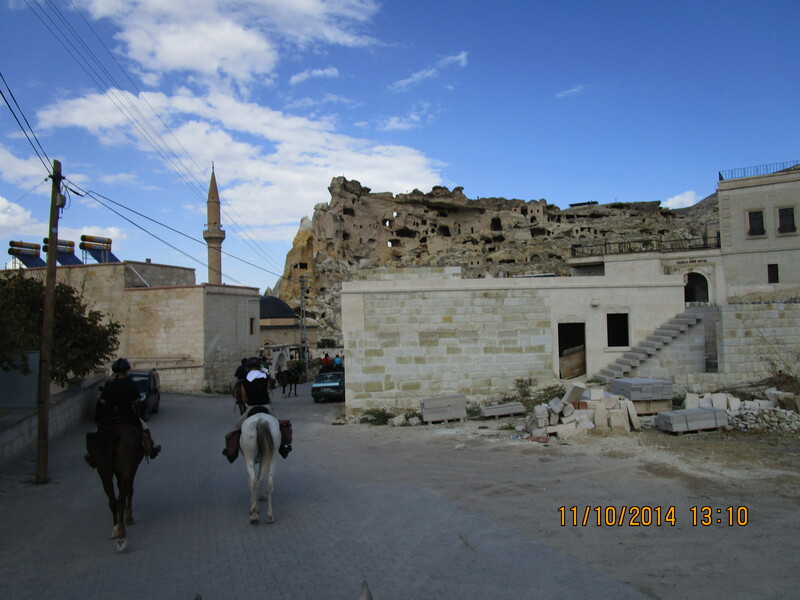 It is normally possible to visit the 14th century mosque before riding on to Karain and the overnight camp. 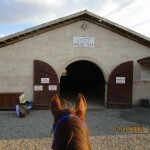 (Riding time 5-6 hours). 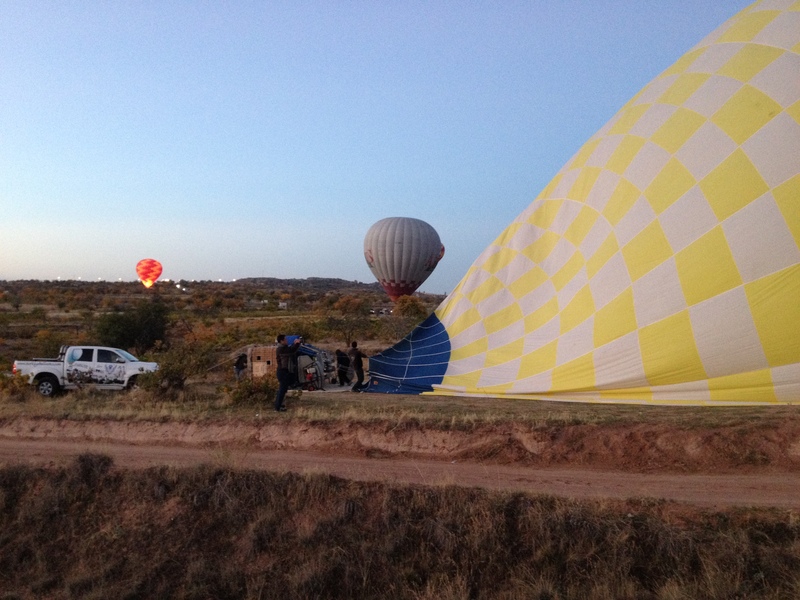 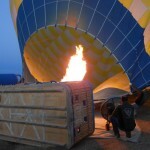 Depending on the weather those who wish might get up very early for a hot air balloon ride (weather dependent). 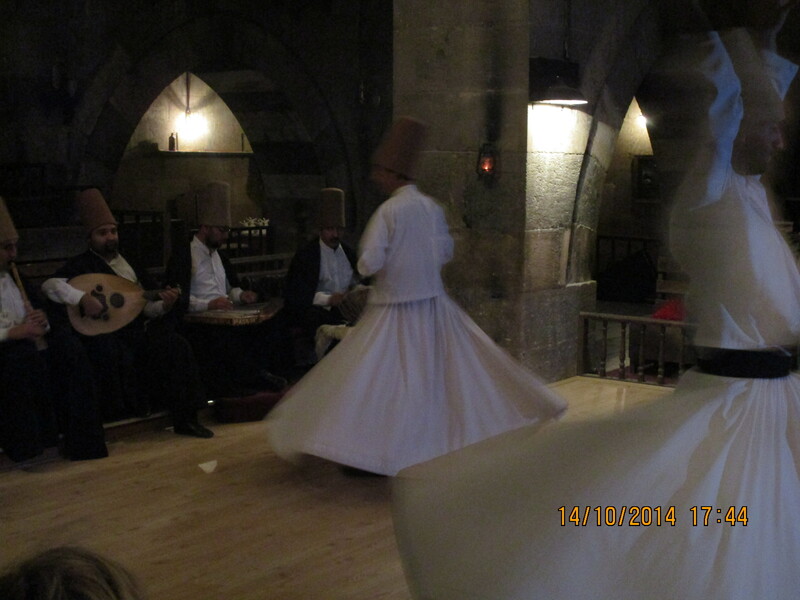 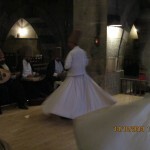 Later you may possibly attend a Dervish Performance at Sarihan at 5:30 pm. 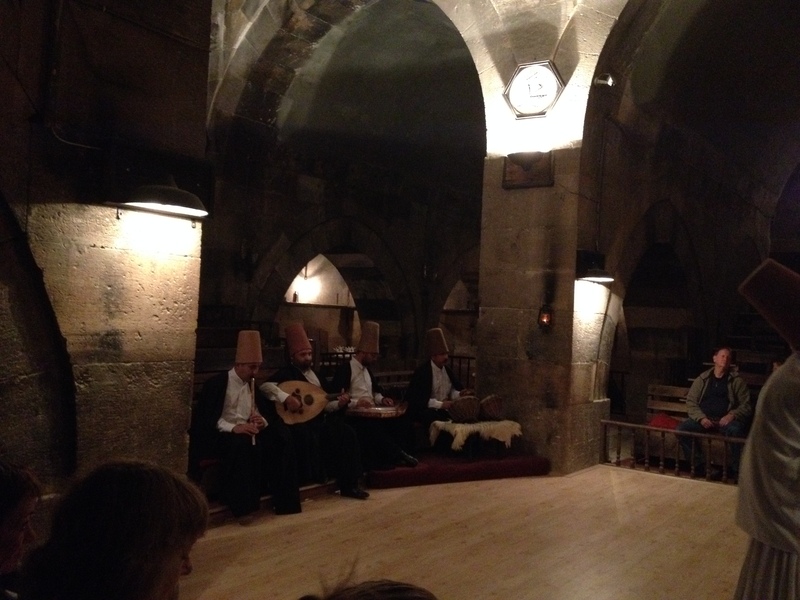 The performance lasts approx 50 minutes. 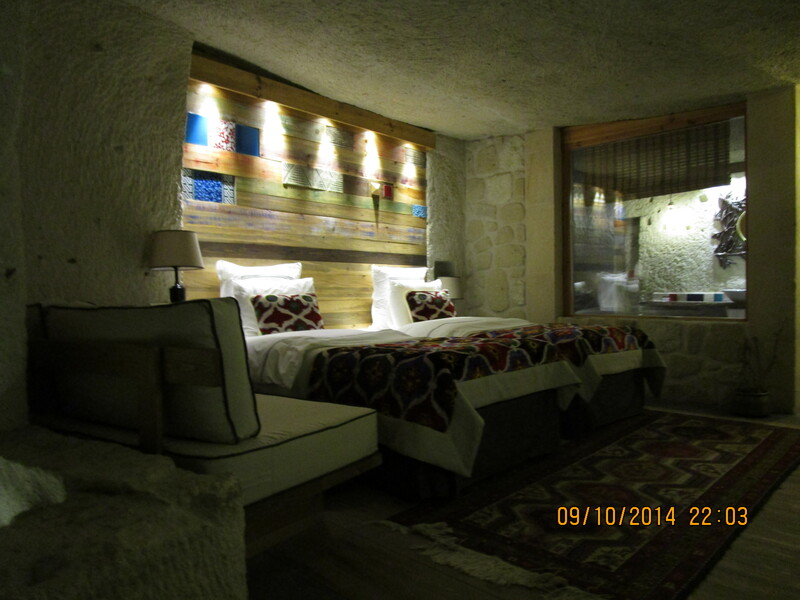 Overnight in Ortahisar. 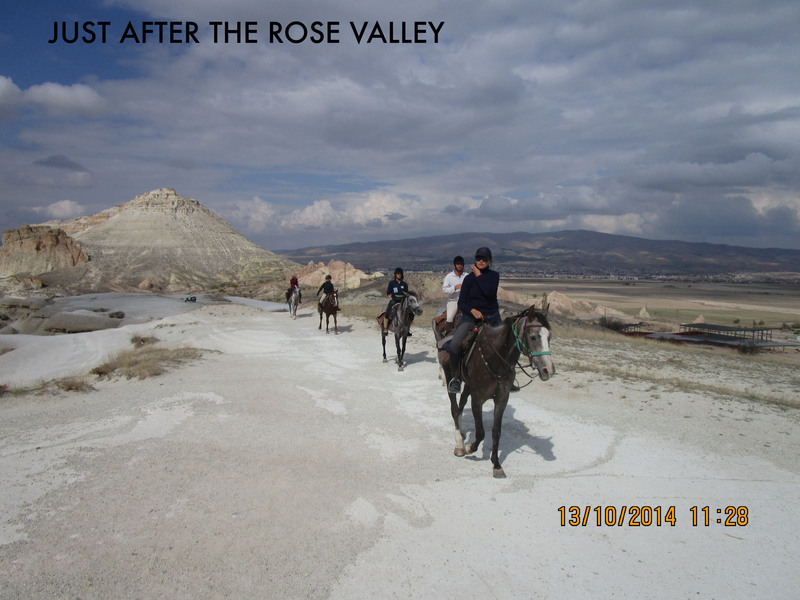 After breakfast transfer to Kayseri or Nevsehir for departure flights. 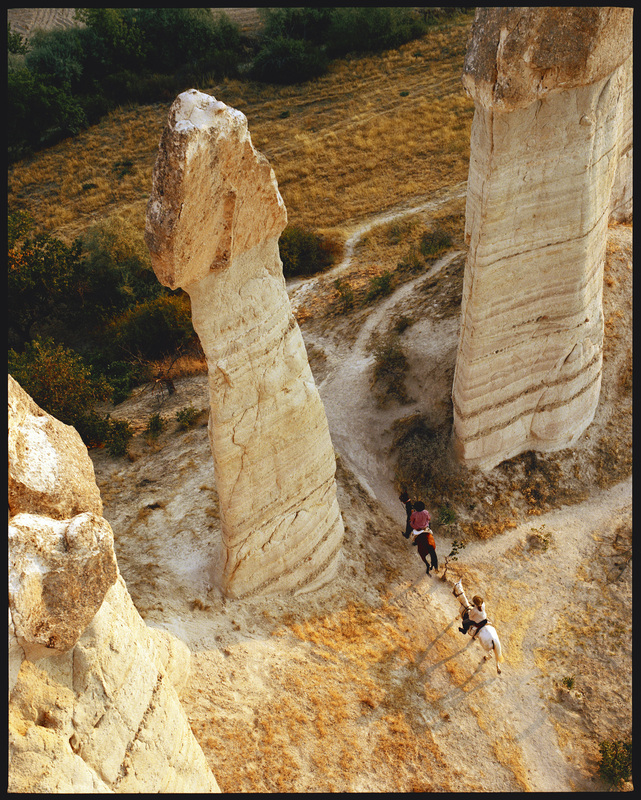 This cultural exploration of Western Turkey traces the ancient empire of the Phrygians which existed from the 12th to the 6th century BC. 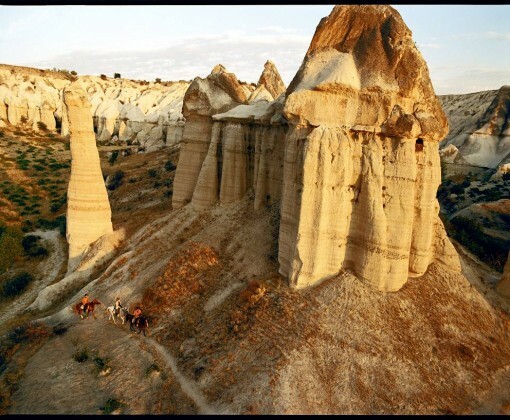 We will pass through areas of stunning landscape with rock formations similar to Cappadocia’s landscape, Turkish villages – hardly ever visited by tourists and visit monuments left by the Phrygians. 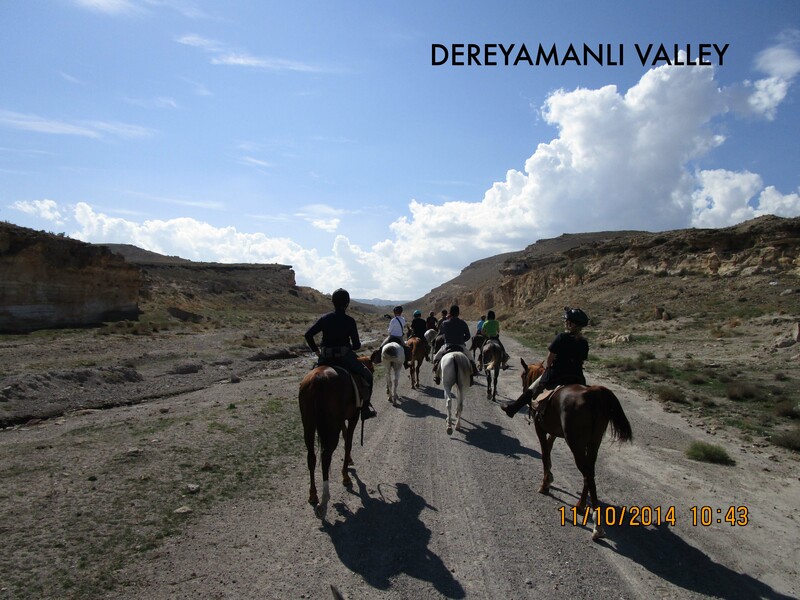 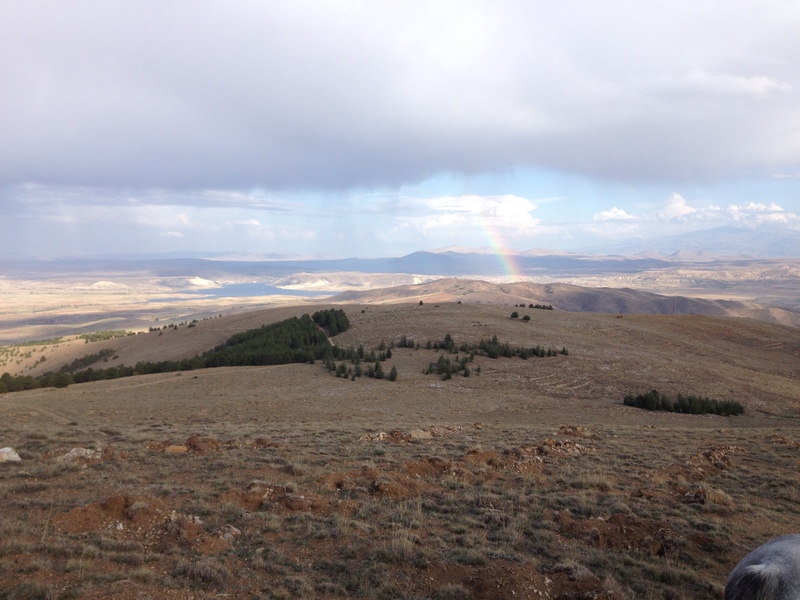 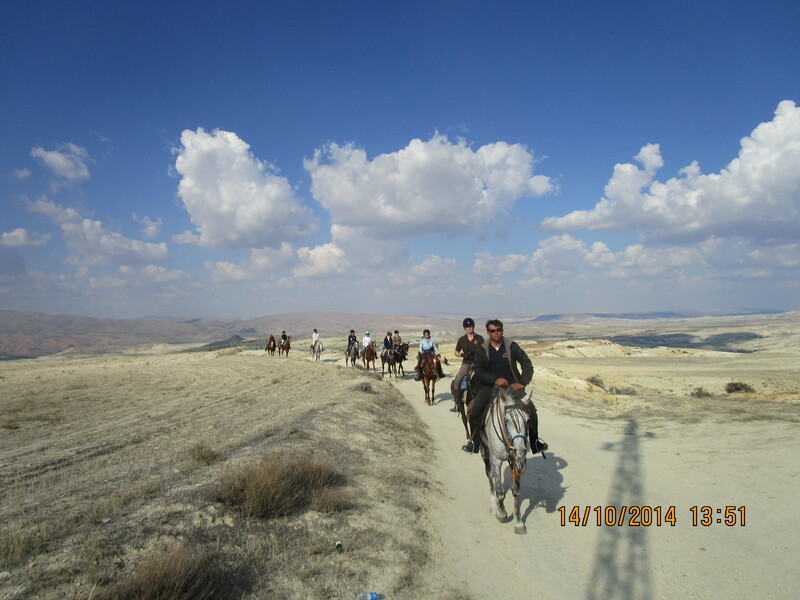 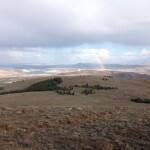 The ride starts in the area of Afyonkarahisar and follows the Phrygian way north-west, visiting Döğer and Midas City. 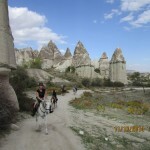 In total we cover about 140 km in 6 days. 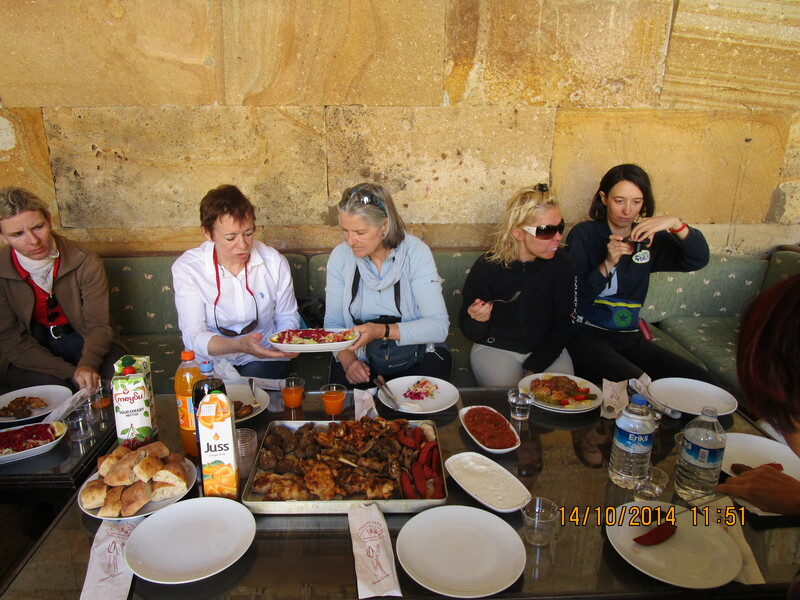 After the ride we visit the city of Kütahya and the impressive remains of the roman city of Aizanoi. 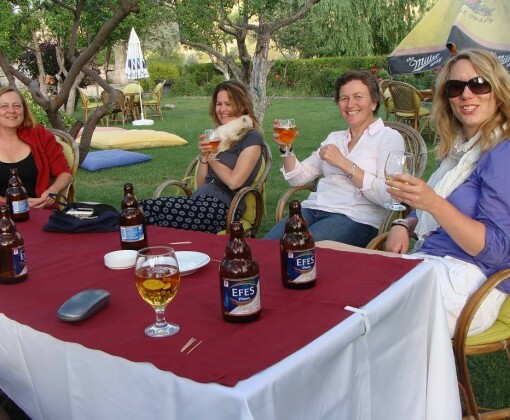 Arrive at the airport and transfer to our hotel in Afyonkarahisar. 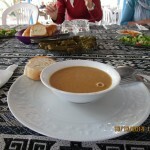 Welcome dinner at a local restaurant. 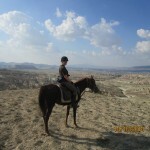 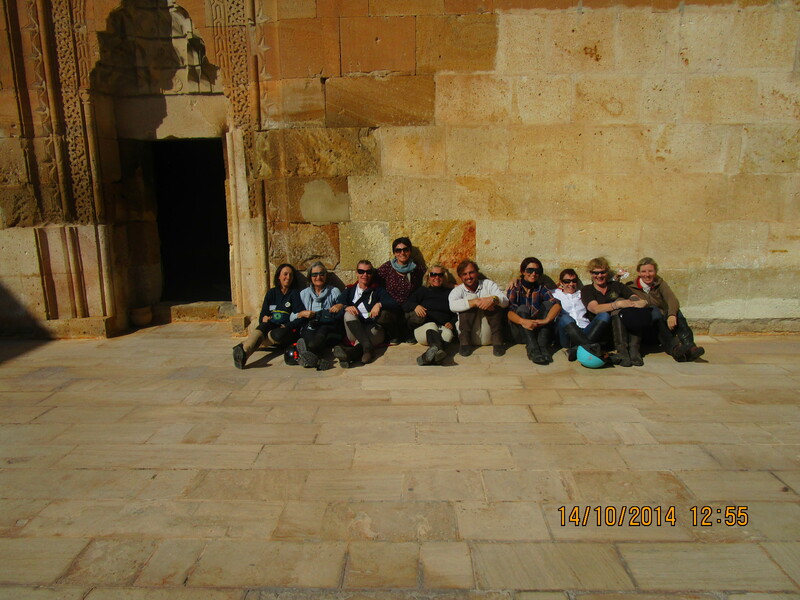 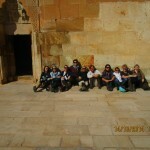 The next day we will visit Afyonkarahisar. 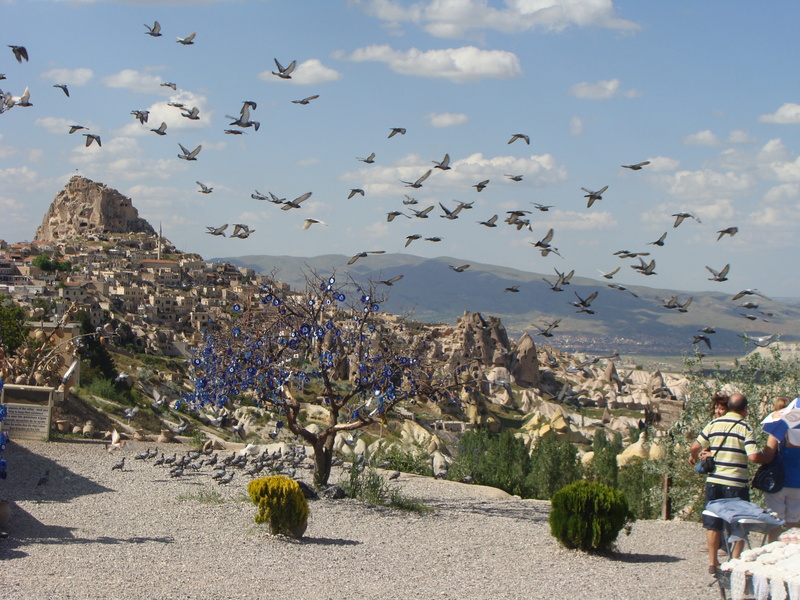 From Afyon’s impressive castle, which was first built around 1350 BC, we have a spectacular view over the city and the area. 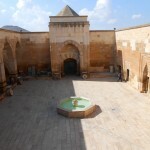 The Large mosque (Ulu Cami) with carved wood pillars built in 1272 is one of the finest examples of this architecture. 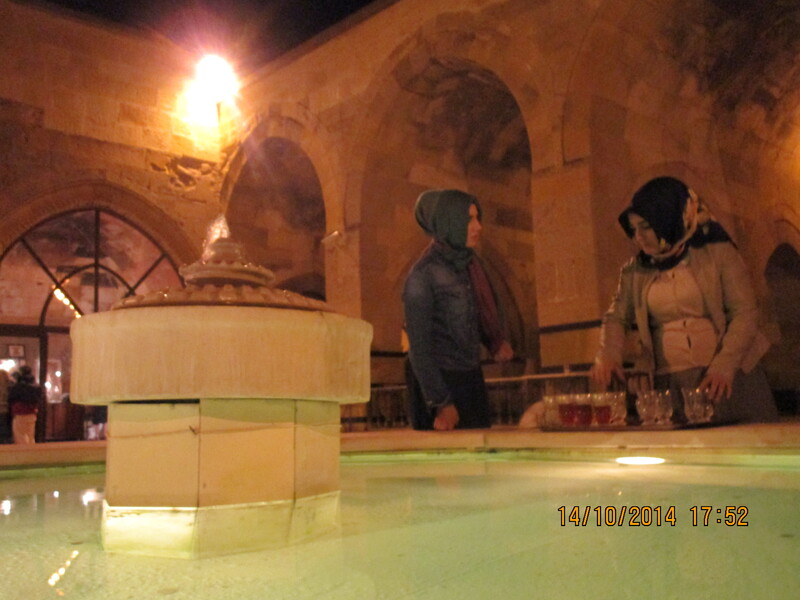 Afyonkarahisar is not only famous for its marble but also for the hot springs. 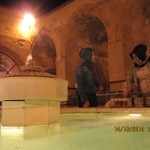 We can take our time to relax in a hot spring before starting our ride. 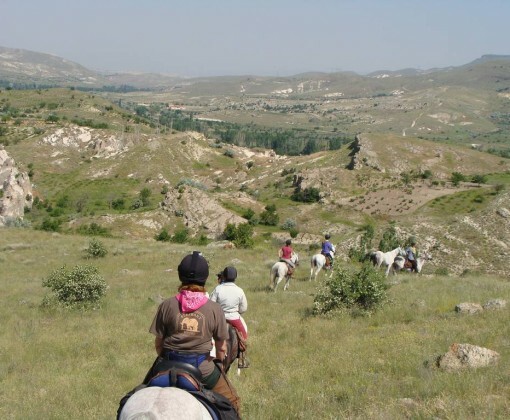 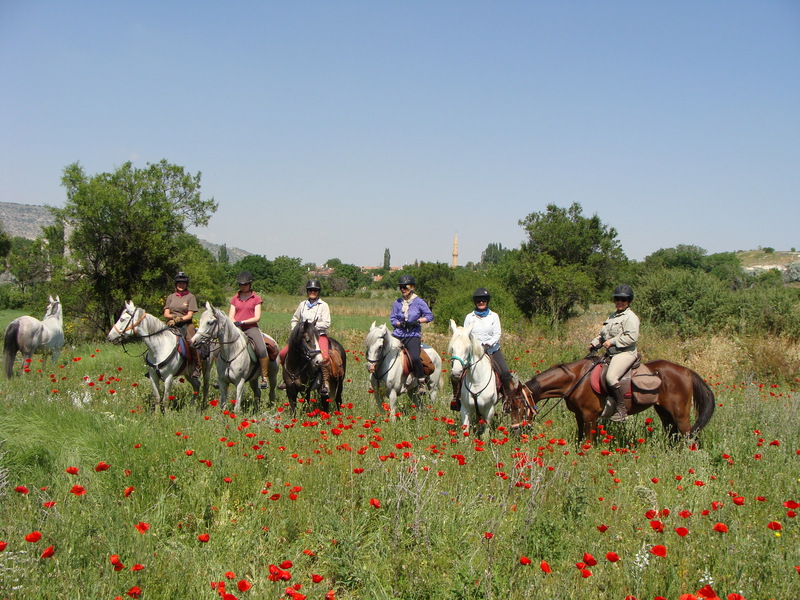 After breakfast next morning, we will meet the horses and start our ride in the area of Seydiler and follow the Phrygian valley north to Olukpinar. 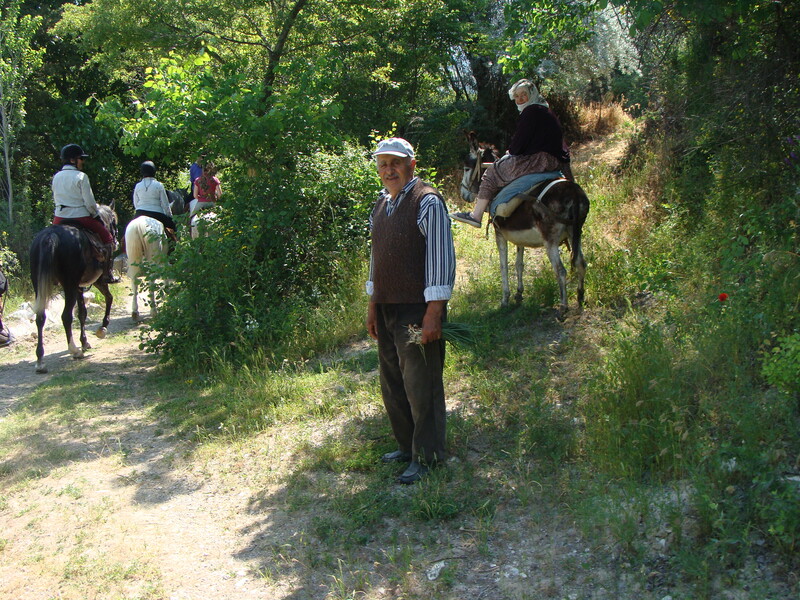 On the way, we pass through small villages, hardly ever visited by tourists and get an impression of rural life in this area. 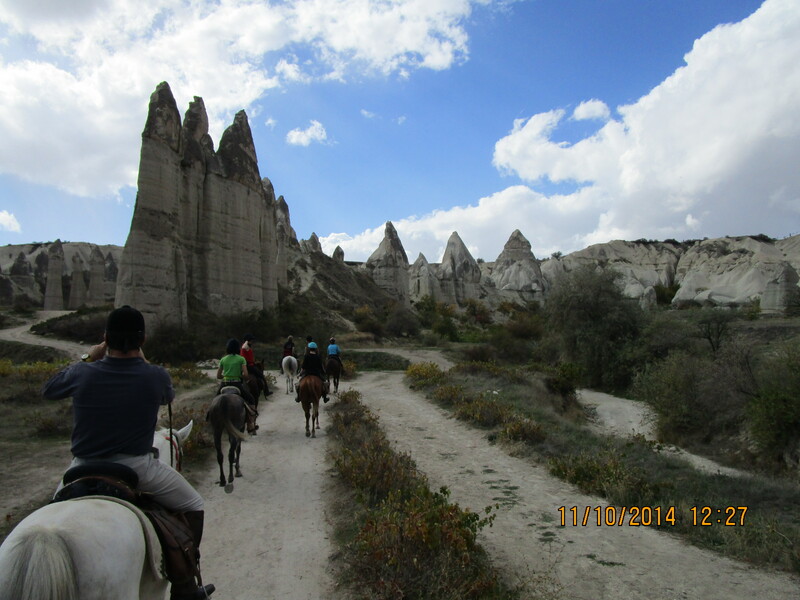 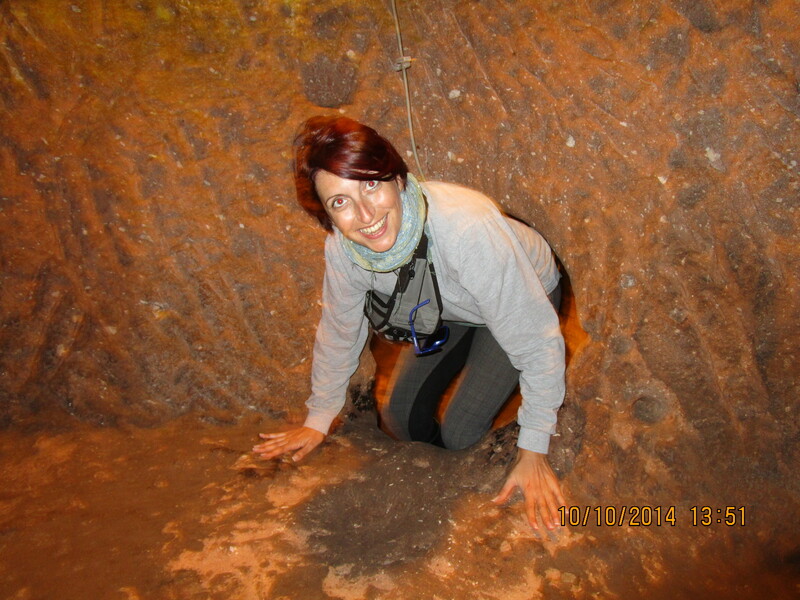 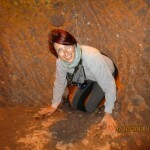 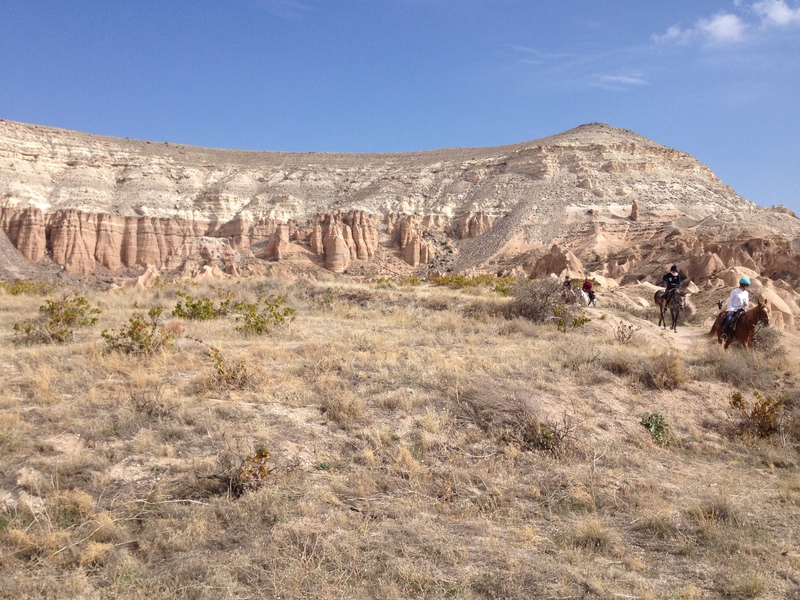 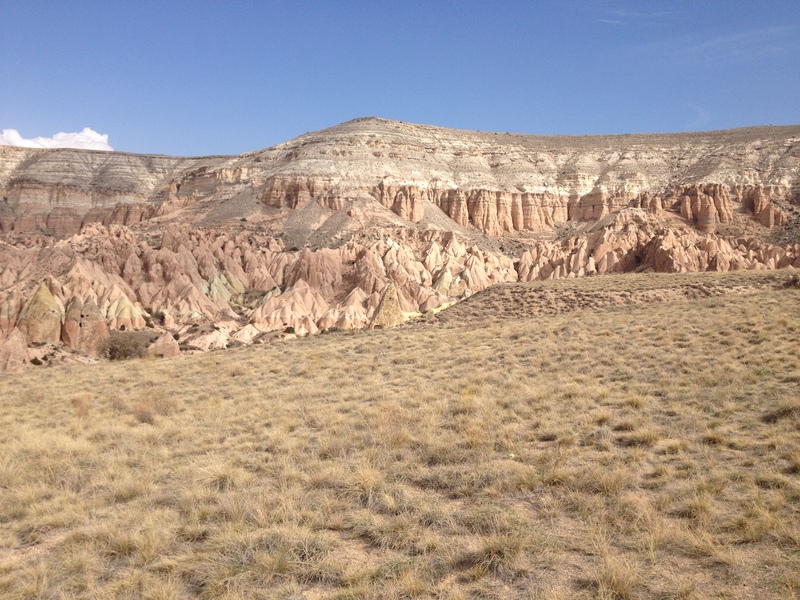 The landscape becomes more dramatic as we carry on and we will discover some decorated caves. 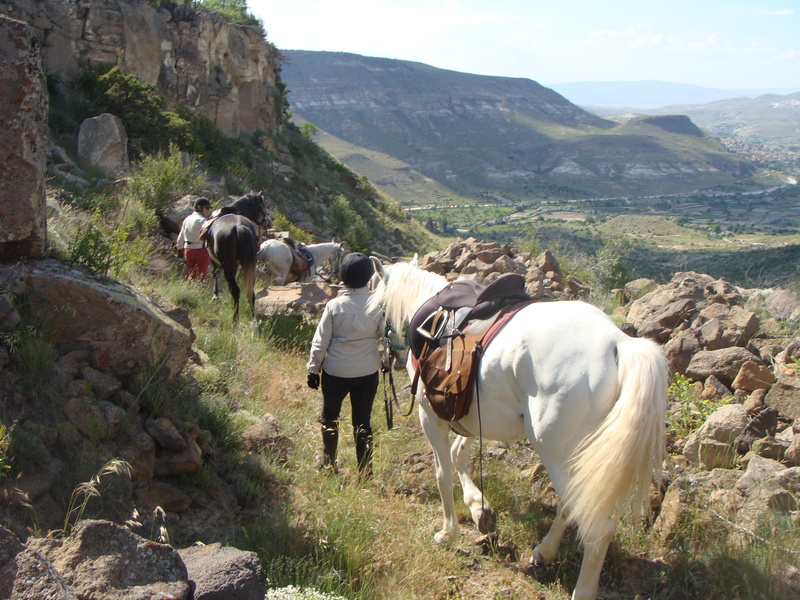 We pass by Ayazini with its carved church. 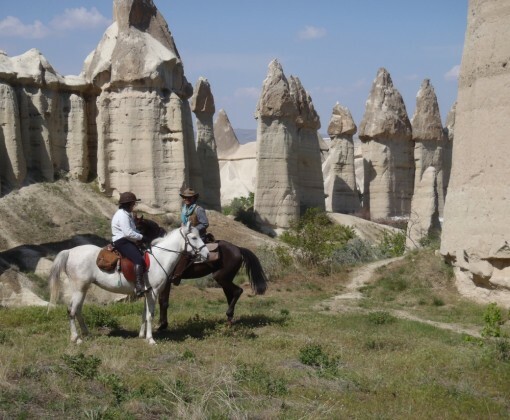 On our ride we pass the Phrygian sites of Maltaş and the burial sites at Aslantaş and Yılantaş. 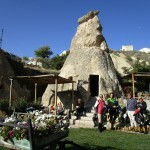 We also see Arslankaya, the “Lions stone”, near the village of Bayramaliler. 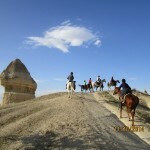 Ride along the shore of the Lake Emre Gölü with its picturesque rock formations and head east to the mountain area, where we camp near Sarıcaova. 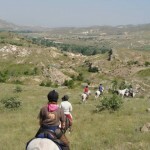 Today’s rides passes through a beautiful forest and mountain area. 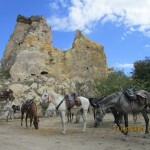 Overnight we stay near an ancient cave complex. 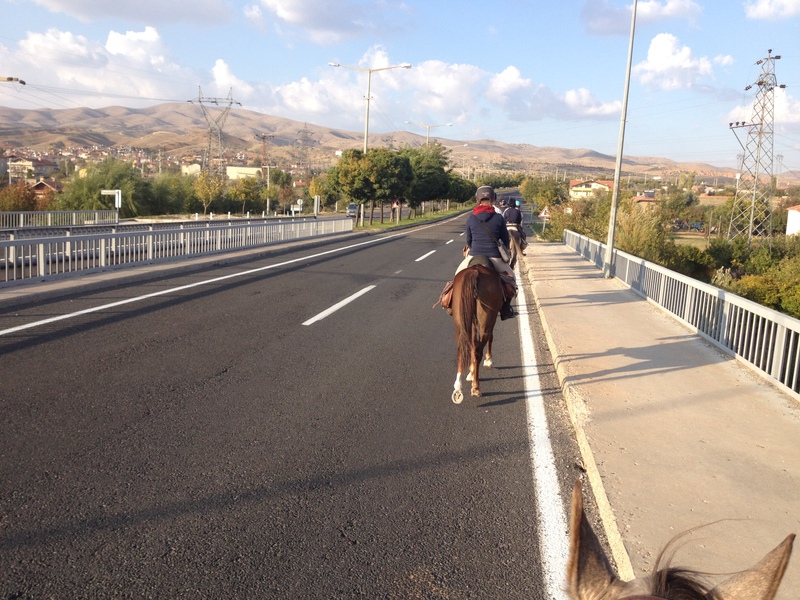 We ride to Yazılıkaya, where the ruins of Midas city have been found. 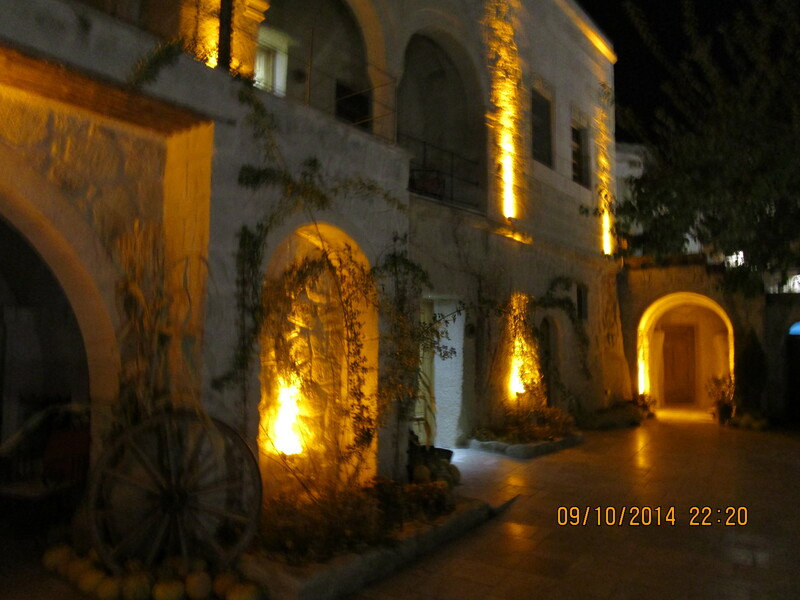 This is one the most important sites of Phrygian culture. 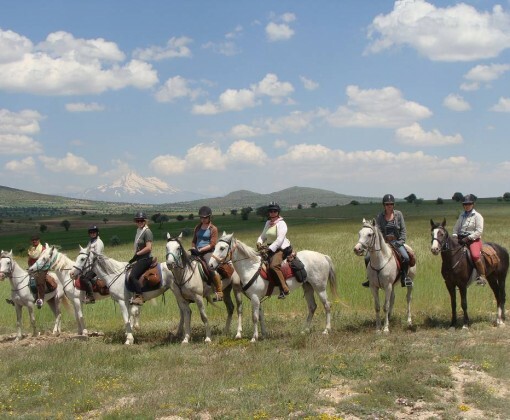 We will visit the plateau, seeing the Midas monument and other artefacts of Phrygian culture. 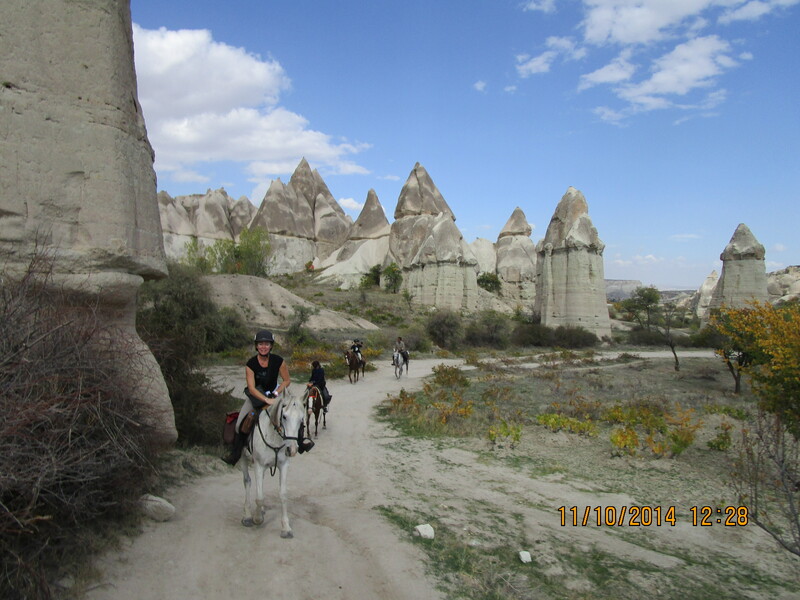 Continuing north along the valley we see an impressive rock castle. 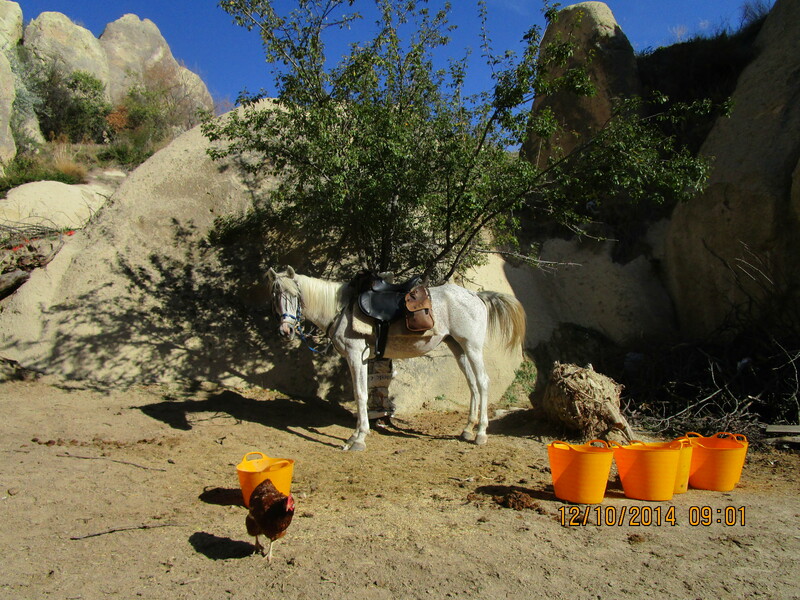 In the afternoon we leave the horses near Çukurca and drive to Kütahya where we can take a stroll around the old city before dinner. 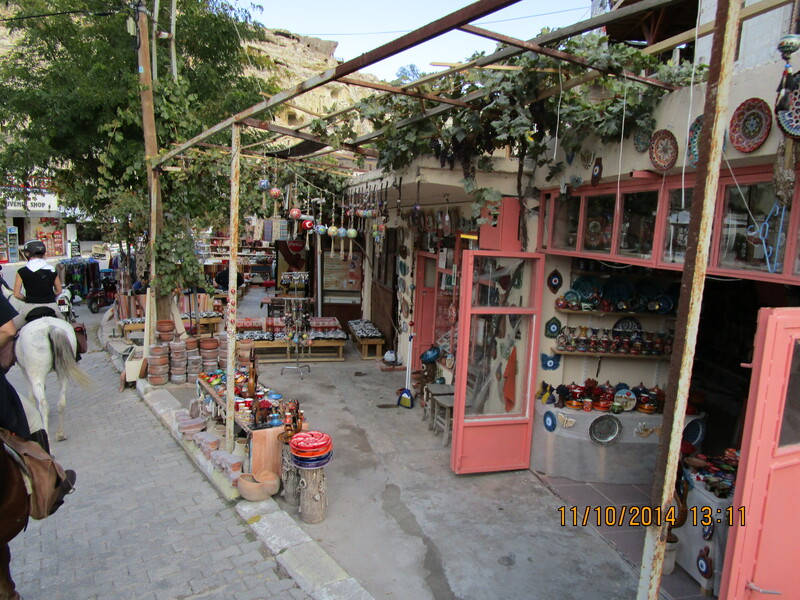 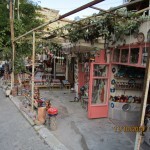 Visit to the historical town of Kütahya with time for shopping before lunch. 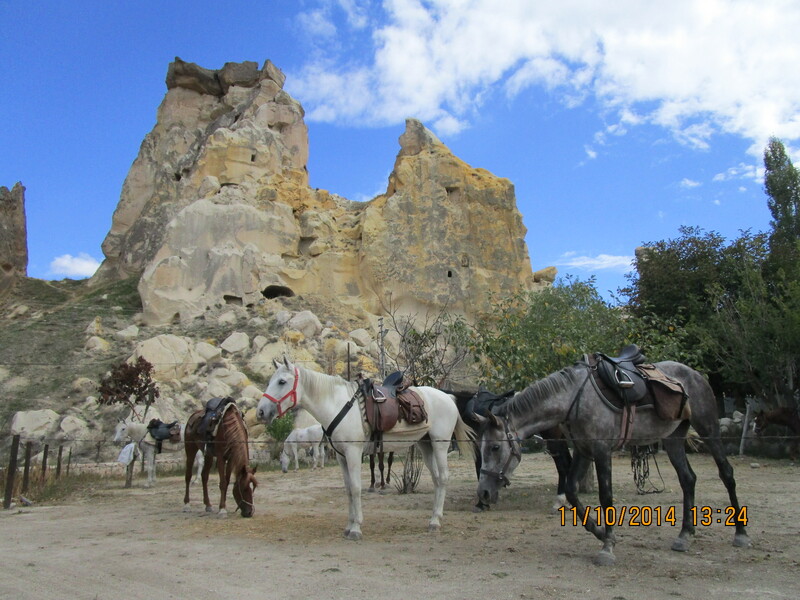 In the afternoon we drive to Cavdarhisar, where we visit the ruins of the roman city of Aizanoi, with its impressive temple to Zeus. 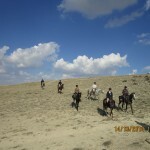 The second trip from 11th to 20th August, will run in reverse. 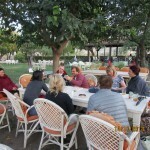 Accommodation is in hotels in Afyonkarahisar and Kütahya, on other nights its camping. 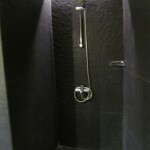 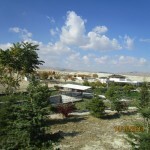 Shower and toilet facilities are provided at the camps. 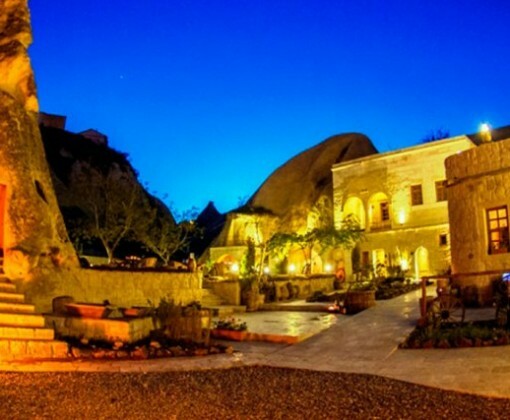 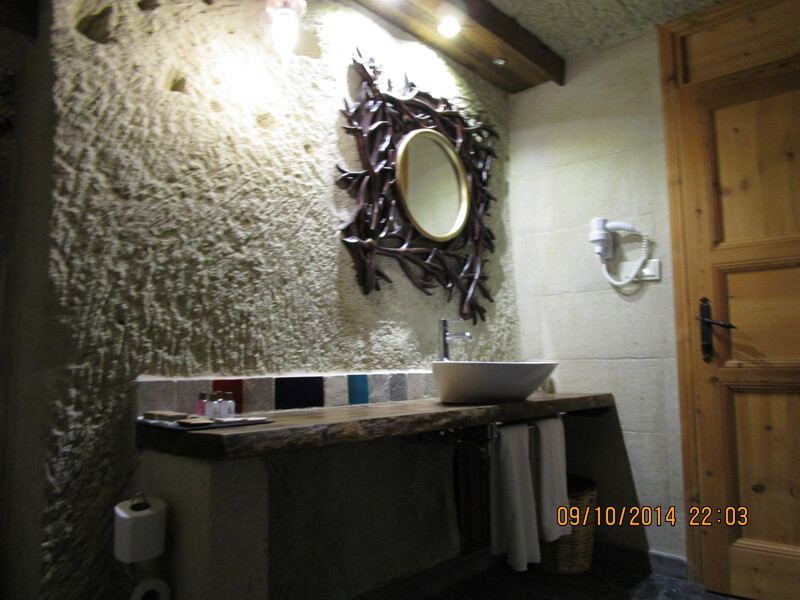 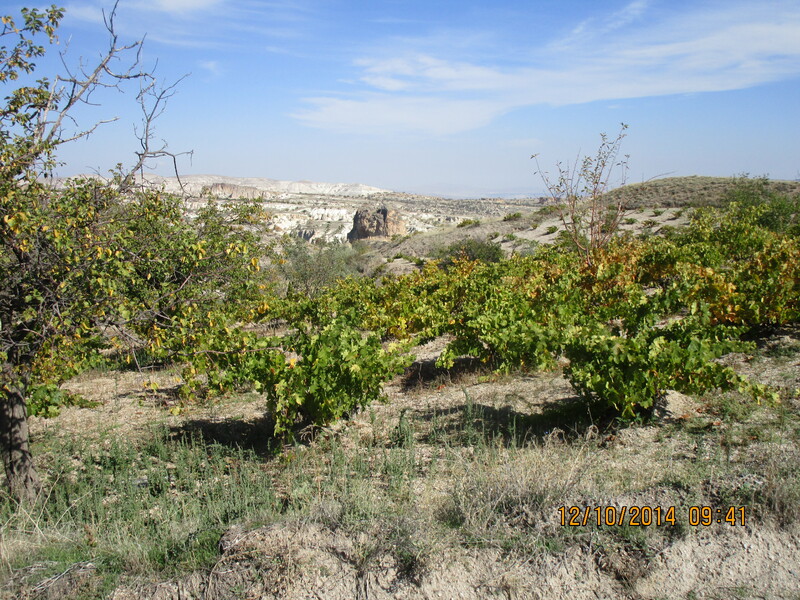 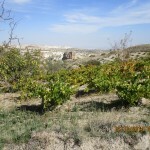 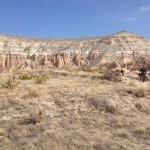 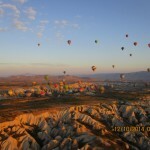 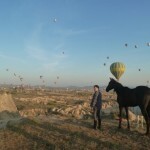 I løpet av turen «Cappadocia Highlights» bor du bo på hotell, vanligvis Queen´s Cave i Ortahisar, men av og til kan vi bruke andre hoteller av samme kvalitet. 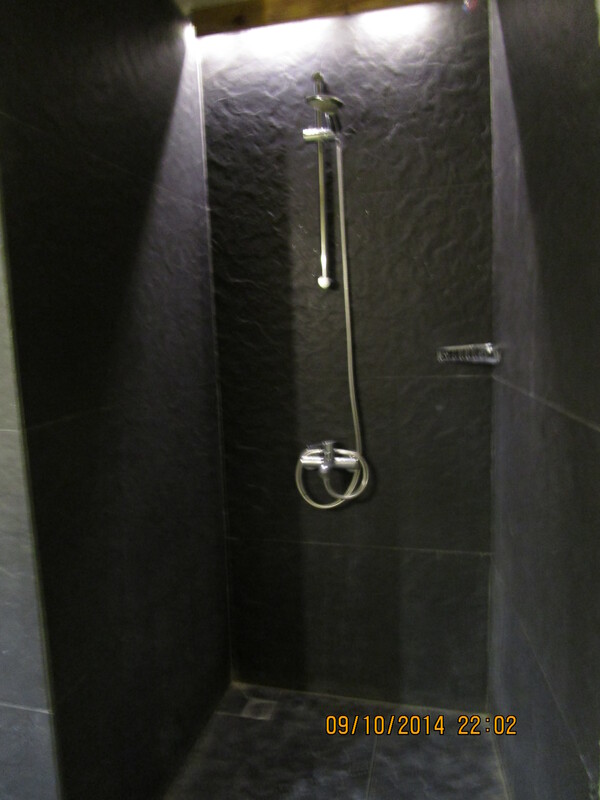 Det unike «hule» hotellet kombinerer hus og huleboliger hvor alle er restaurert for å beholde sine unike strukturer, samtidig som det tilbyr en høy kvalitet. 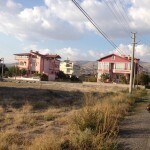 Fordelen med hulerommene er at de er kjølige om sommeren og varme om vinteren. 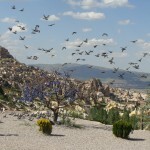 De vulkanske bergarter som kalles «tuff» har en naturlig egenskap som gjør at temperaturen i rommet vil være mellom 13° C til 15° C grader hele året. 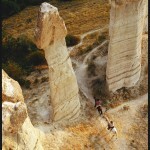 På «Fairy Chimney Ride» er de to første og to siste nettene på hotell, mens du camper på de andre nettene. 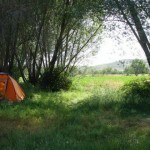 Alt camping utstyr har stedet, med unntak av sovepose som du bør ta med deg selv. 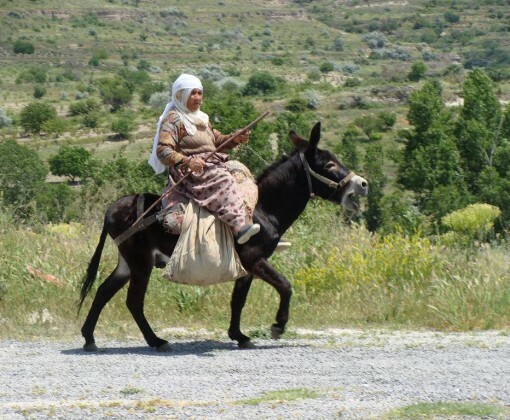 Leirens støttemannskap, inkludert kokk, reiser med bil hvor også all bagasjen transporteres for gjestene. 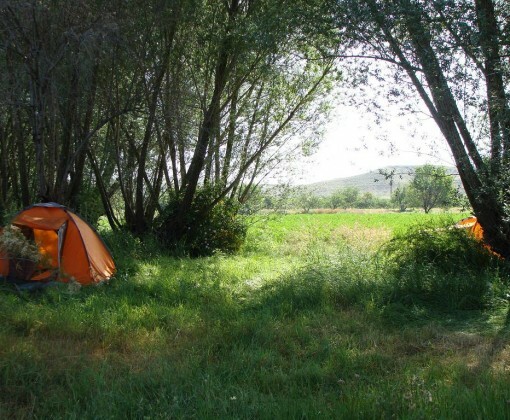 Campingplassen er behagelig, men ikke luksuriøs. 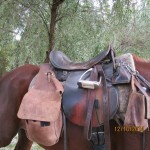 Det er skumgummimadrasser i teltene. 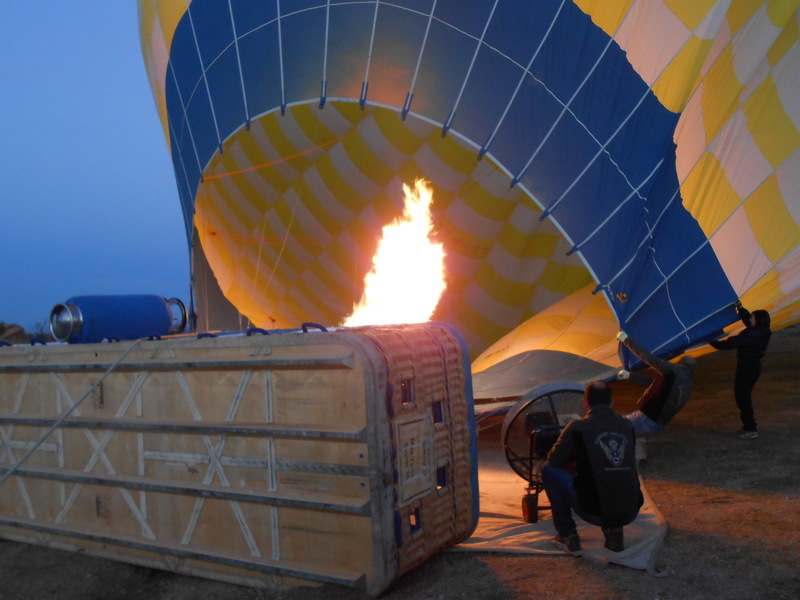 Normalt brukes de store toroms telt med egen del for bagasje og hvor kan skifte klær. 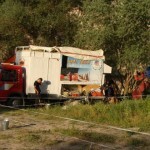 Hver person vil ha et separat soverom, enten den ene halvparten av disse store teltene eller sitt eget mindre telt. 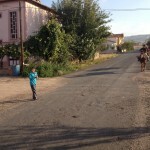 Det er med fullt utstyrt kjøkken samt bord og stoler for bespisning. 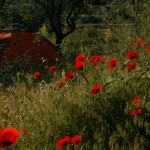 Campingplassen er enkel uten fasiliteter. 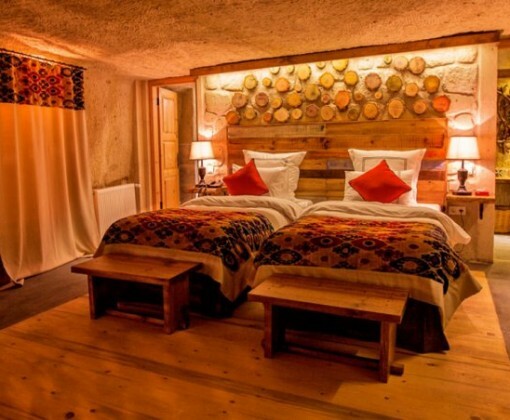 På en av campingnettene kan du få muligheten til å besøke et lokalt tyrkisk bad. 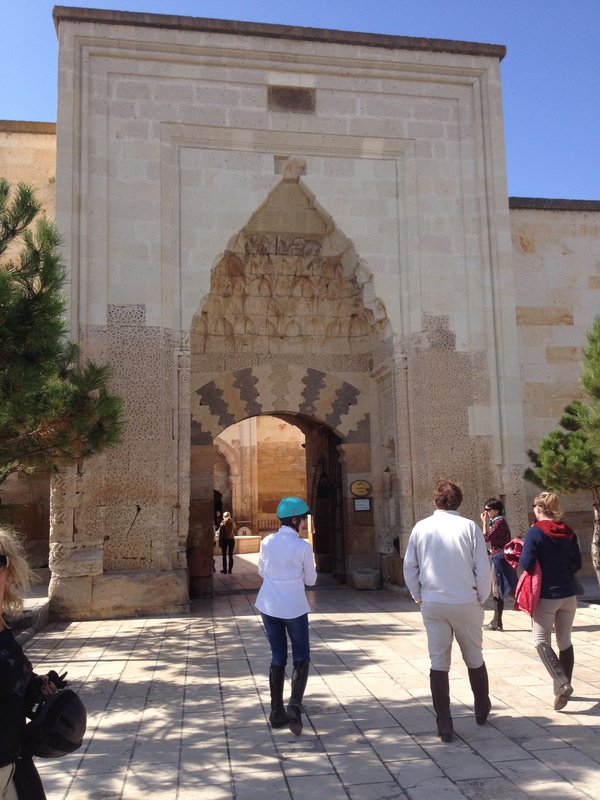 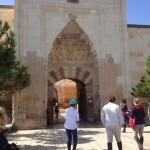 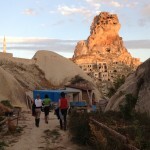 INKLUDERT: Ridning og guiding, overnatting med fullpensjon inkludert drikke uten alkohol, inngangspenger til Goreme Open Air Museum og Whirling Dervish opptreden (hvis er i programmet). 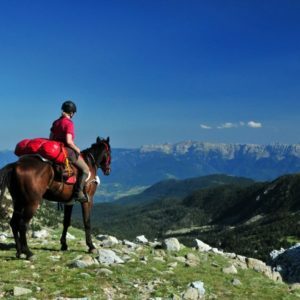 ENKELTROMSTILLEGG: Betales hvis er i enkeltrom. 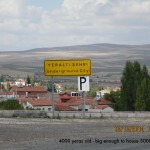 Dette kan bli refundert hvis du er villig til å dele rom og vi finner en du kan dele med. 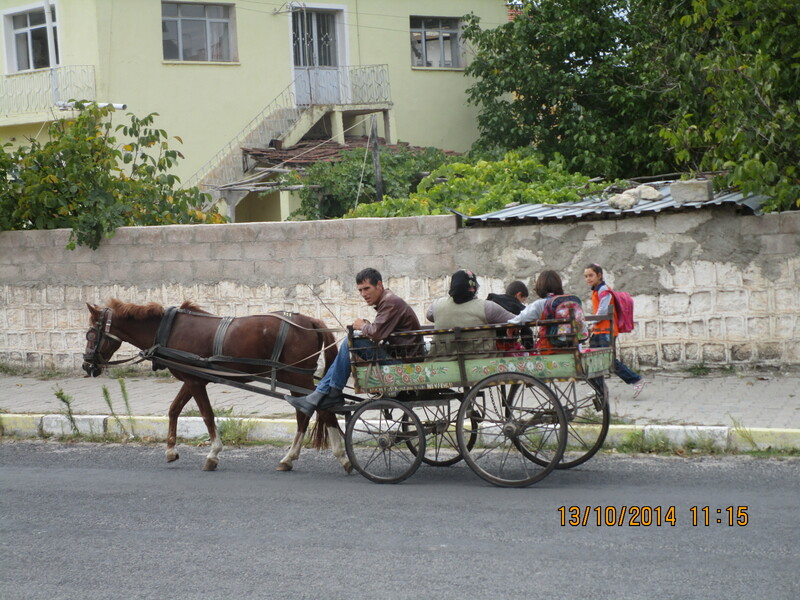 TRANSPORT: Inkludert fra Kayseri på bestemte tidspunkt. 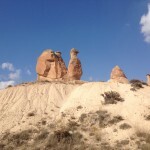 Transport fra Nevsehir kan også arrangeres. 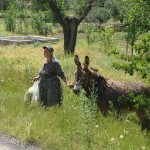 Kappadocia ligger i det sentrale Tyrkia. 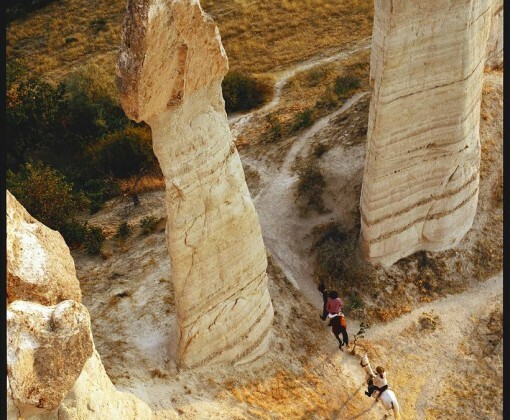 Nærmeste flyplasser er Nevsehir eller Kayseri hvor begge er en kort flytur fra Istanbul. 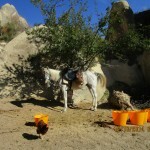 Kappadokia har typisk kontinentalt klima med tørre somre og kalde vintre. 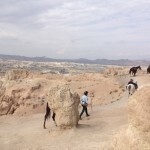 Det er lite nedbør og regionen er i stor grad semi-arid. 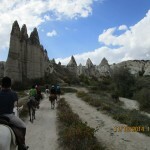 April til juni og september / oktober er den beste tiden av året å reise. 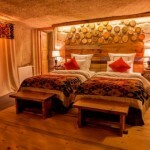 Det er stor forskjell i temperatur mellom dag og natt, og det er ikke uvanlig å ha frost netter sammen med varme dager. 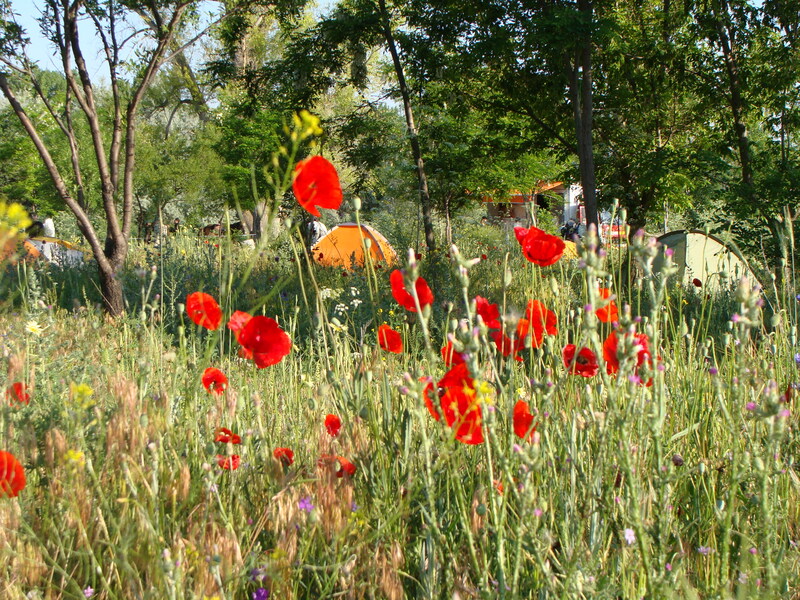 Den gjennomsnittlige temperaturen i løpet av sommermånedene er 23 grader.